"If you like endless street photography - India is for you"
India - It's a country packed with endless diversity for the visitor. No other country on the planet can match what India has to offer. There's so much to see and explore, that it would take years to cover the entire country. Festivals and cultural events are spread far and wide throughout the year. Historical ancient temples, havelis, castles, and monasteries are endless, and will definitely satisfy anyone's mindset, curiosity and vision. 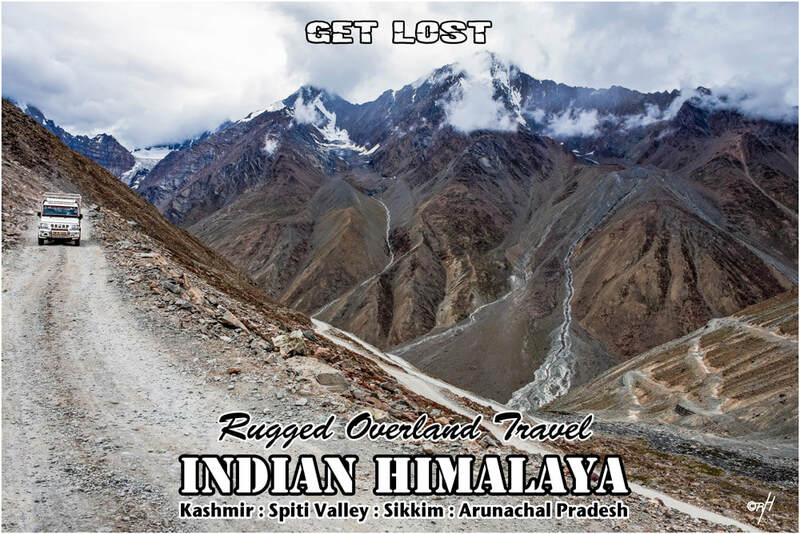 India's rugged highland Himalayan mountain region is absolutely mind blowing, especially within the Ladakh, and Spiti valley regions, including the eastern states of West Bengal, Sikkim, Assam and Arunachal Pradesh. The western deserts situated in Gujarat and Rajasthan are both famous for wildlife, and are mixed with an array of tribal cultural lifestyles. 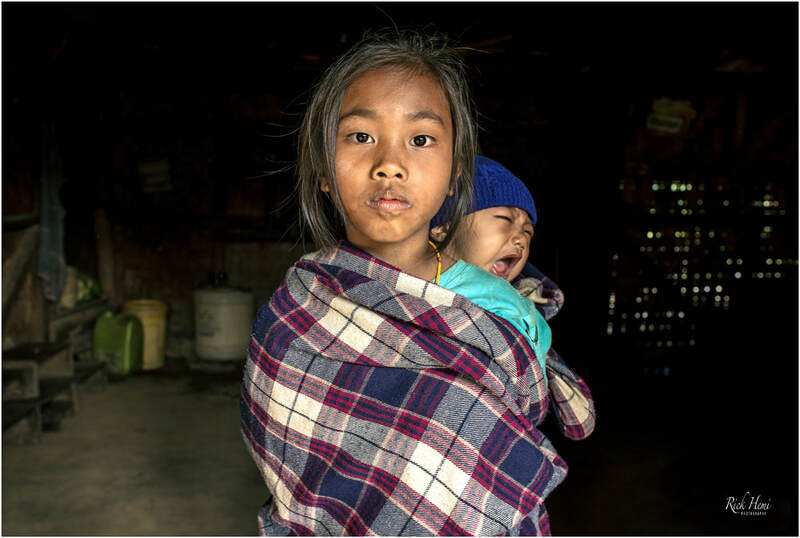 ​The north eastern states of Nagaland and Manipur which border beside Myanmar are bustling with various ethnic tribal communities like the Konyak and Kuki tribes. There are large amounts of wildlife parks scattered across the Indian sub-continent, which alone will absorb lots of time and energy to visit, especially when the migratory season begins. 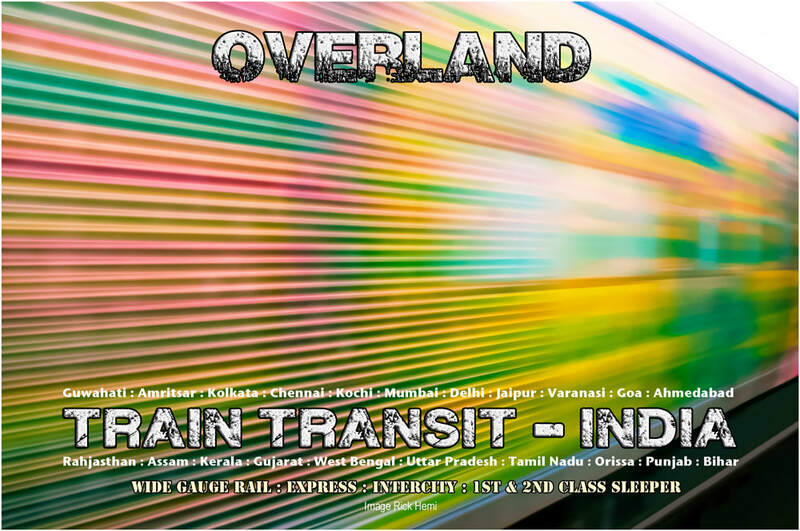 Traveling and transiting solo across the country is simplified by using India's well-constructed and established train network in any desired direction chosen. As for the Indians themselves in short, they will certainly wear you out with lots of humour, and vibrant hospitality with plenty of entertaining conversations, and chit chat. Ten days of ground pounding tribal song and dance - Don't miss it if you're in eastern India, This festival begins on the 1st of December through to the 10th of December each year. The Gangasagar Mela situated 120 km's south of Kolkata is also well worth the effort to experience. 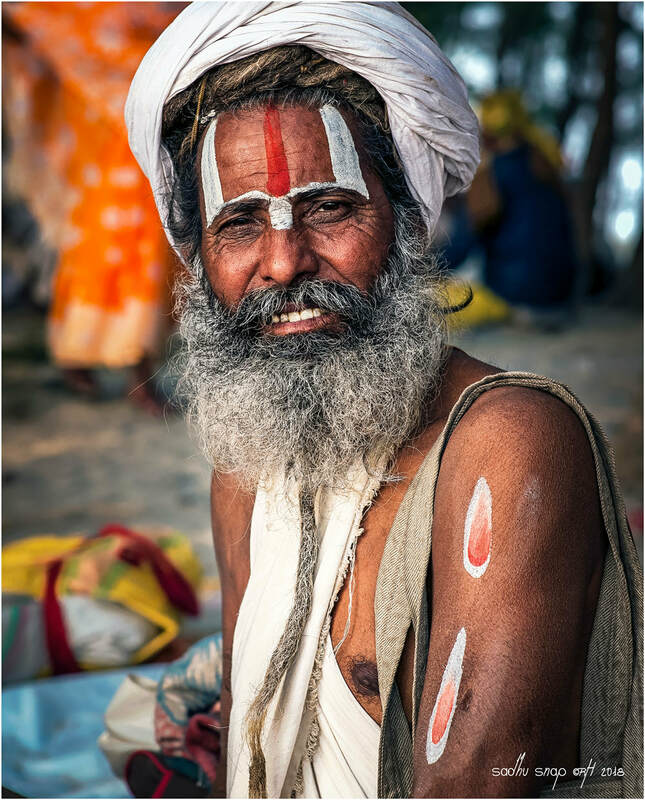 If you're in to random portrait photography, the 1 million+ pilgrims visiting Sagar island will keep you busy and active through the 3 day festival. Accommodation is the great outdoors beside the beach - warm clothing, a blanket, or a tent is required. We all have our own personal taste, vision and technique to capture amazing street snaps of total strangers that have appealing reasons in the first place to capture them. India certainly has an endless amount of opportunity to do this with unlimited options to randomly photograph locals without any fuss or hassle. Personally, I've always enjoyed taking random street captures of anyone that catches the corner of my eye who looks vibrant within their environment. The opportunities throughout India to randomly photograph locals will give anyone the satisfaction of taking rewarding image captures. Random street photography is virtually limitless without boundaries in India. In general, capturing portraits of locals will usually take only a small amount of interaction time. Using basic street rules of respect and tolerance will yield rewarding images of locals through the country. 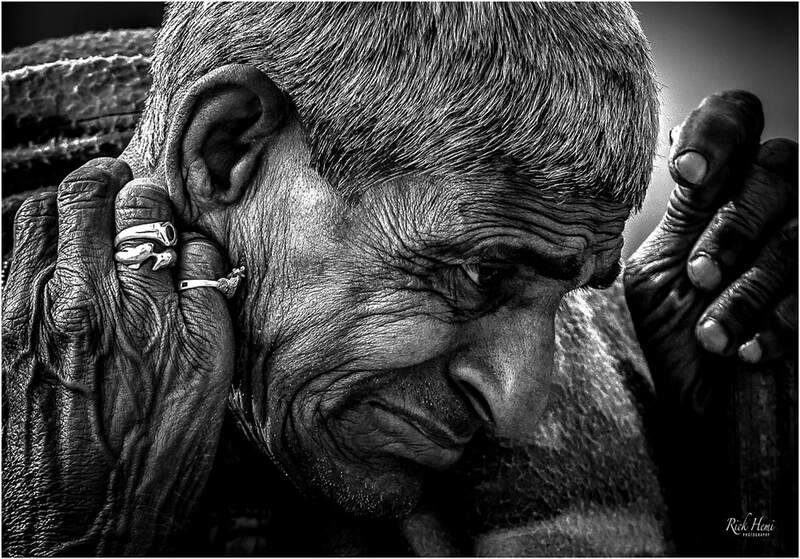 Depending on taste, it doesn't really matter if portrait images are captured in colour or black and white, the strong facial expressions and composure remains the same. Solo Travel India - Don't Think Twice - Do it! Are you looking for peace and quiet well away from social media, selfie addicts, and overspill of foriegn tourists like in Nepal? heading up to the Himalayan highlands in India still has plenty of open spaces from the craziness seen else where. During winter, the image above is a total whiteout through Spiti valley. The only access road through to this untamed region during winter is via Shimla to Kaza. Another isolated region is Arunachal Pradesh state situated north of Assam state. 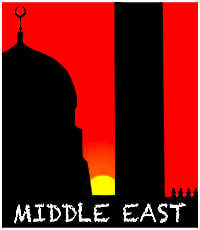 Both areas have their own diverse cultural and heritage stepped back in time. Hiking through serene wilderness spotting wildlife habitat can't be better. Transport getting there is by shared vans or with public bush-buses. Renting and driving your own 4x4 can also be done, but only those with previous experience driving on high altitude dirt tracks covered in snow (during winter) should consider doing this. During the summer season, renting an MC (Royal Enfield) is the way to go for a full on road trip experience that certainly won't disappoint. 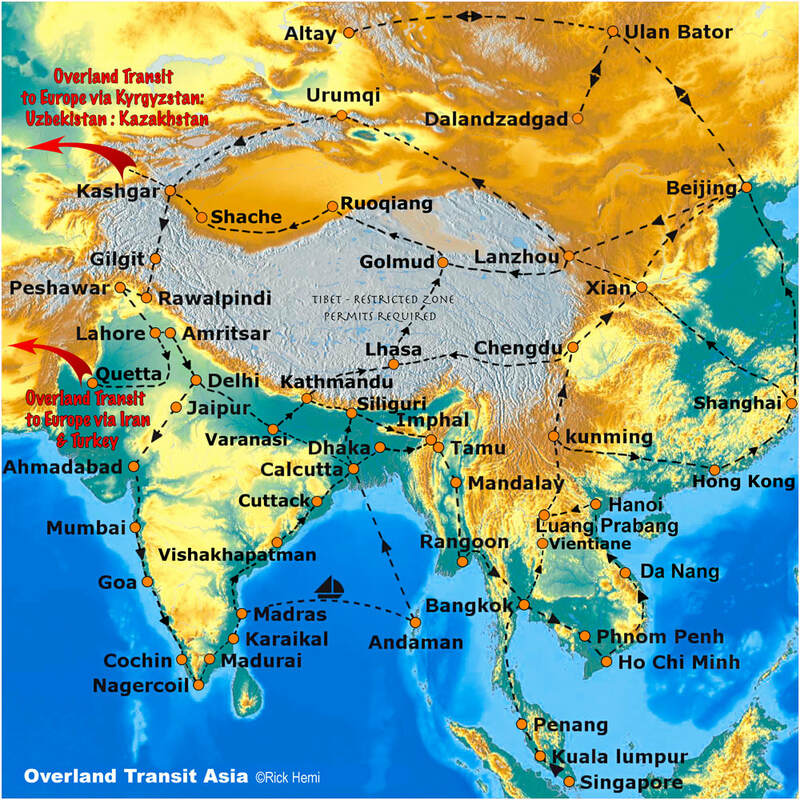 Foreigners will need permits transiting through to Kaza from Shimla, a permit is also required to travel in unrestricted areas in Arunachal Pradesh. Having plenty of time on your hands visiting these regions is necessary due to their isolation. 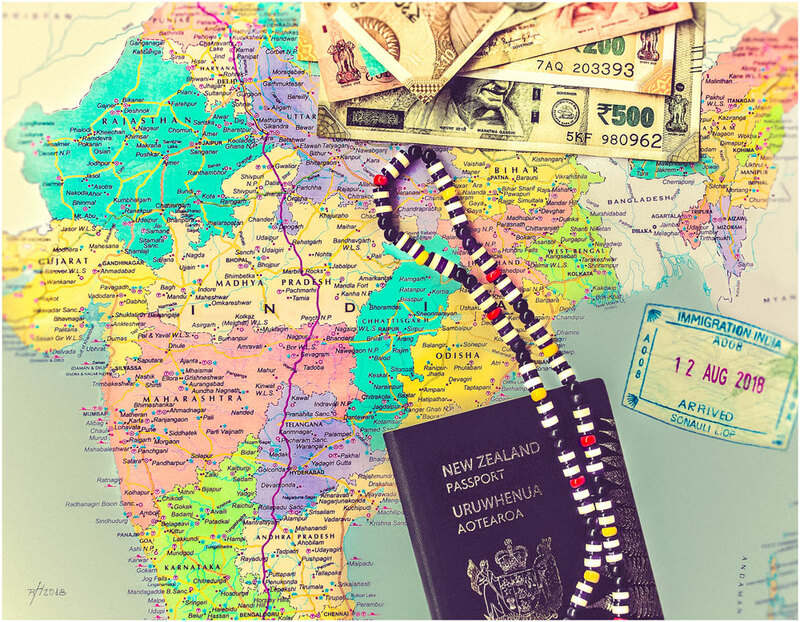 Reaching India overland can be done a few ways although all issued six month Indian visas begin their countdown on the day they are issued. This will mean any overland route to India will reduced the amount of stay if an Indian visa had been issued well in advance. Crossing land borders from Myanmar, Nepal, Bangladesh and Pakistan can still be done, but there are sporadical border closures at the Tamu/Moreh Myanmar crossing which may or may not be open, and will need to be verified for the latest updates in Mandalay before transiting towards the border. A Burmese permit to cross the Tamu/Moreh border is also required - there's more on this in the Overland Travel page. The Indian/Pakistani border is at the Wagah Atari crossing. Depending on nationality, an Indian visa can be issued from the Indian High Commission in Islamabad, but paperwork and online applications must be presented without any flaws including the correct sized photos. The choices of land border crossings between Nepal and Bangladesh to India are many without complications. Indian six month visas can still be obtained at the Indian Consulate in Chittagong. The Indian Embassy in Nepal do issue six month visas if it's a first time visit to India, but foreigners who have already been issued six month visas in their passports will find it very difficult to receive another six month visa, and receive a three or one month visa instead. This solely depends at the discretion of Embassy staff when submitting the visa request no matter if it's done on a Monday or a Friday. The Indian Consulate in Kandy, Sri Lanka is known to issue six month visas to different nationalities with passports already containing used six month visas without issues, but this may change in the future with new Consular staff. Using any type of camera drone is forbidden in India unless an official permit request is granted by the police, the local administration and from the ministry of aviation. The type of drone, and location coordinates will also be required before any permit is issued. Camera drones may not be used at night if a permit is granted to use one. Direct satellite telephone services are not permitted in India. Handsets of Thuraya, Irridium and other such satellite operators are prohibited. 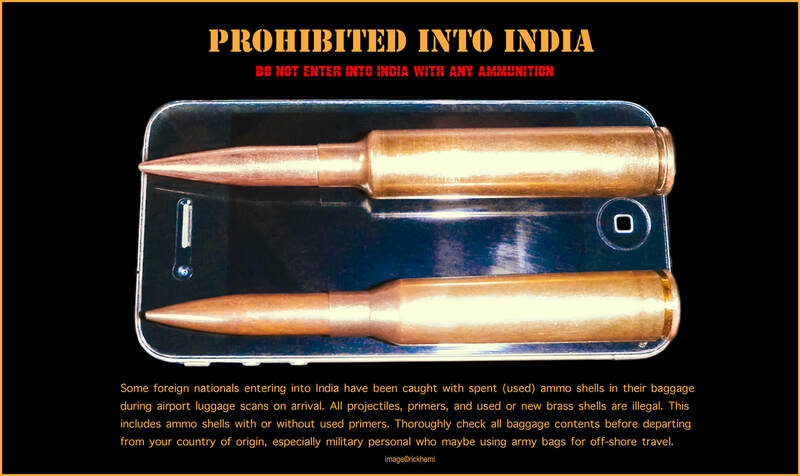 As a warning - those visiting India who are found to be in possession of any of these sets mentioned above will be automatically seized at the port of entry, and the holder could be prosecuted under Section 6 of Indian Wireless Act and Section 20 of Indian Telegraph Act. Large quantities of gold must be declared upon arrival, Indian customs are very thorough at International airport entries through the country. Shaft bolts are commonly used in many hotels throughout India. Using your own personally heavy duty lock will guarantee baggage and belongings won't disappear from rooms. A simple solution to hang or dry out clothes and washing on the go is with hiking bootlaces tied together across a room. There's nothing worse than feeling totally drained, which happens a lot to foreigners visiting India. The usual first signs and symptoms are fatigue and lethargy. 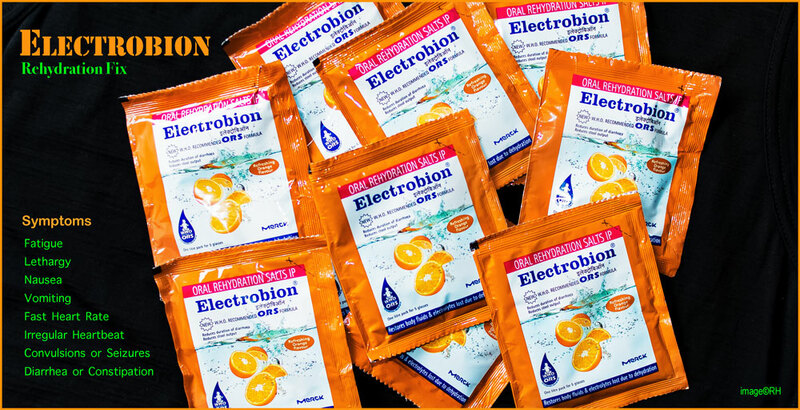 One of the best Oral Rehydration salts that can be purchased through the country is the Electrobion shown above. One sachet mixed with a litre of water and guzzled down in one hit will take immediate effect. Travelling with a few extra sachets is recommended. Indian railways has you covered in any direction chosen covering over 115,000 kilometres. 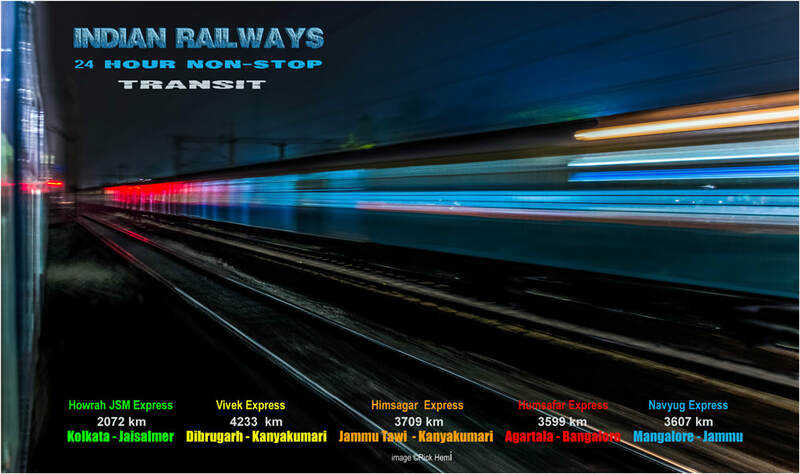 The Vivek Express from Dibrugarh to Kanyakumari is still the longest non-stop train journey in India covering 4,235 kilometres with 80 scheduled stops, and taking a total of 80 hours (3.3 days). Early bookings are necessary for a 2nd class 2 tier AC sleeper birth. For more privacy a 1st class sleeper will be double the price. Those who are running on a tight budget across the country have the choice of using the 3 tier non AC sleeper class which will certainly give any foreigner the feel and touch of the Indian rush. Although train fares have risen considerably in the last two years, it still remains the cheapest transport in the country. 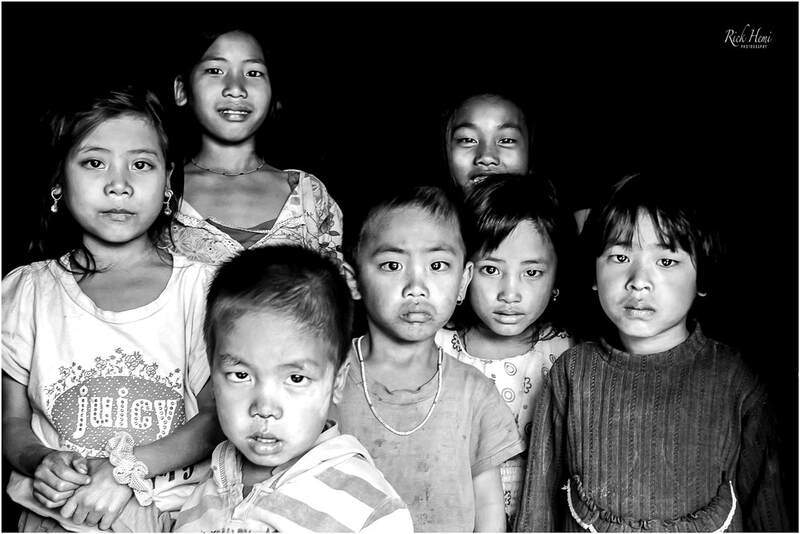 Tribal children from the interior region of northern Nagaland. 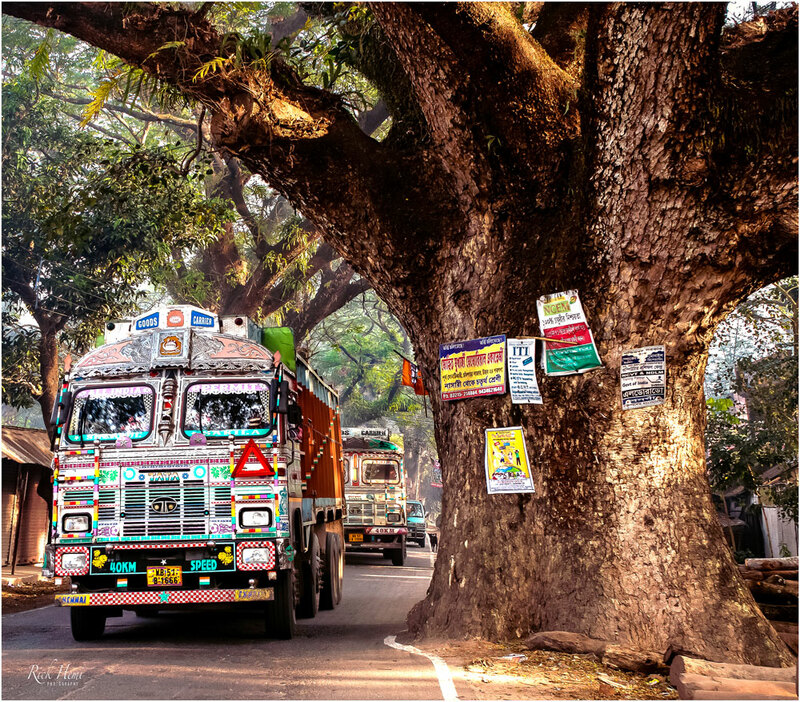 Getting to this district is a mission in itself, which takes four days of train, bus, truck and jeep transit from Kolkata. Due to the sensitivity of Nagaland state, all foreigners need to register on arrival at the local police station in Kohima, and also further north in Mon township. 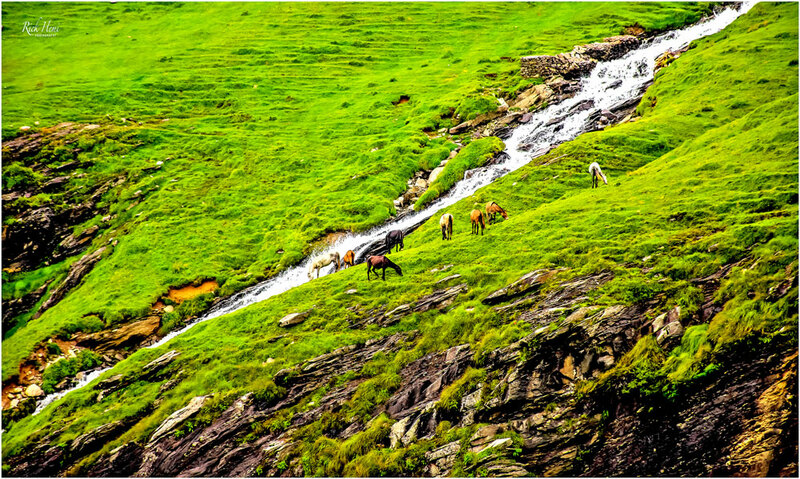 Below, local highland farmers from the mountainous regions of Uttaranchal Pradesh who graze their stock within the most rugged regions of the state during the summer months. 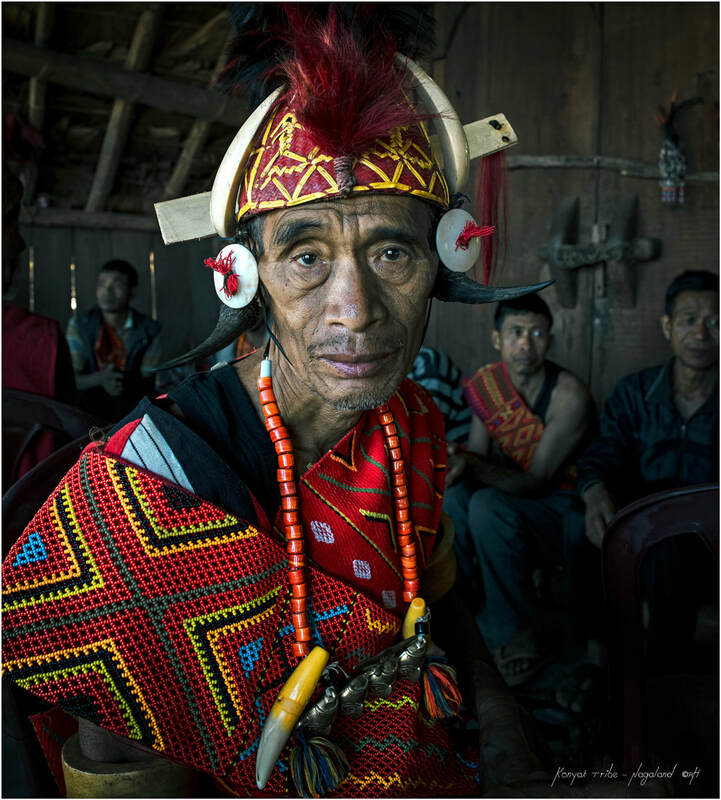 Both Nagaland and Uttaranchal states contain their own tribal and community groups. Everyday one ventures out on the streets , or along the highways the chances of capturing awesome random street snaps of locals magnifies greatly. There's endless amounts of random street portraiture throughout India. One only needs to walk in and around any village or city to find them. The chances of capturing great looking subjects everyday is virtually guaranteed. For example, the image above was taken after a few minutes of polite interacting and chit chat. This woman even invited me into her dwelling for chai and snacks. 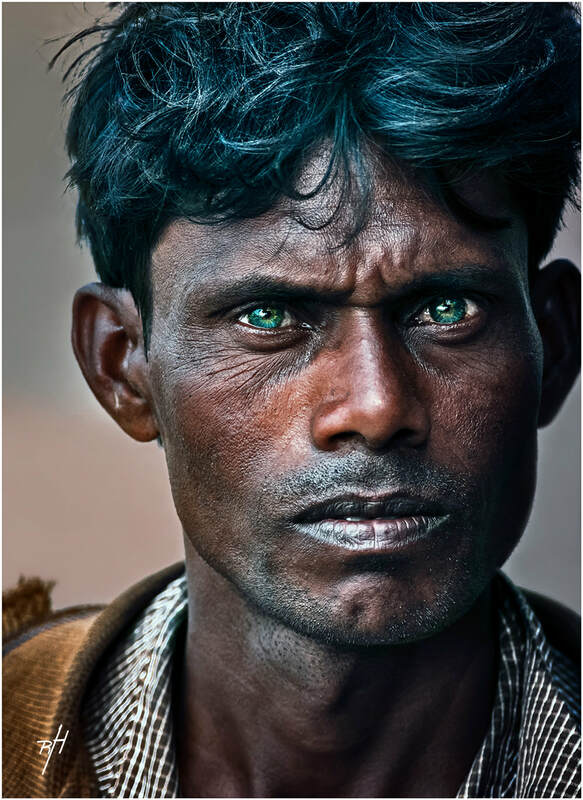 Indians with coloured eyes can be spotted on the street in a flash. The majority of the population of India have brown eyes, but if you're lucky, there's always a chance of coming across a local with brilliant emerald, or hazel coloured eyes. 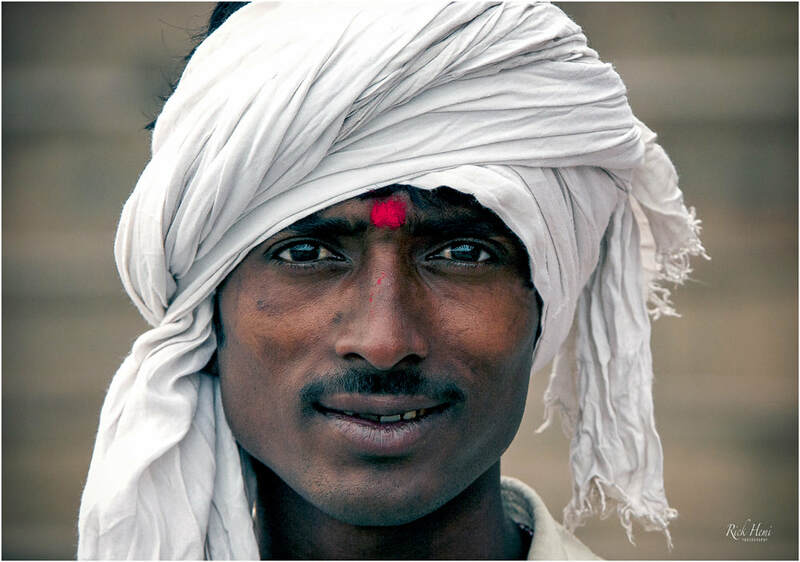 Two great locations that have locals with coloured eyes are Rajasthan and Bihar states. 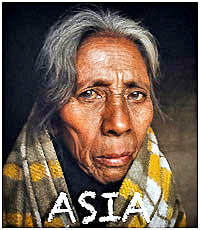 Remote tribal villages in these states are known for some families to have radiant coloured eyes. 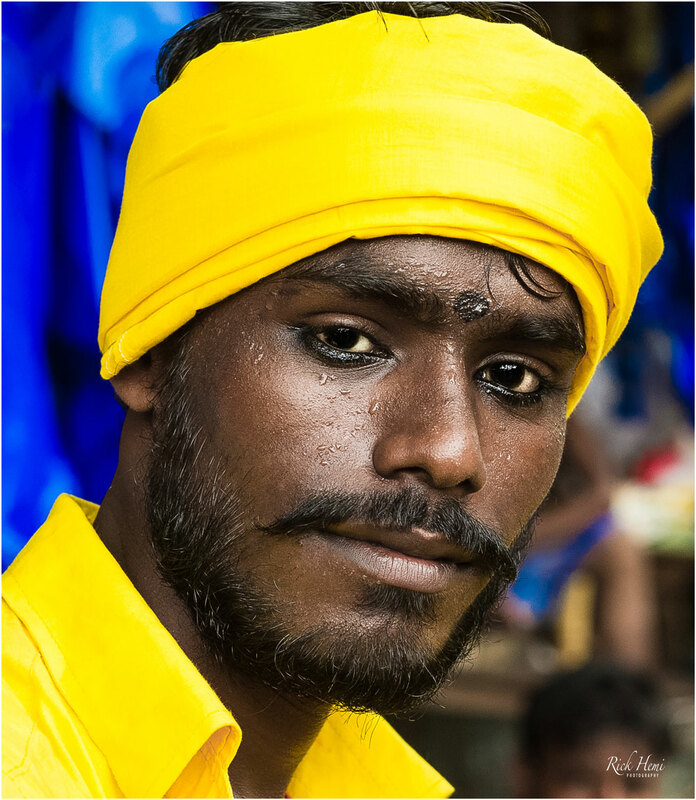 This random street portrait was taken in west Bengal, and captured with a classic Nikon 800mm f/5.6 Ais manual focus lens (1986-05) attached to a D3 body (2007-2011). The image capture shows that you don't need the latest photo-gear or to have large amounts of megapixels to produce a good image. 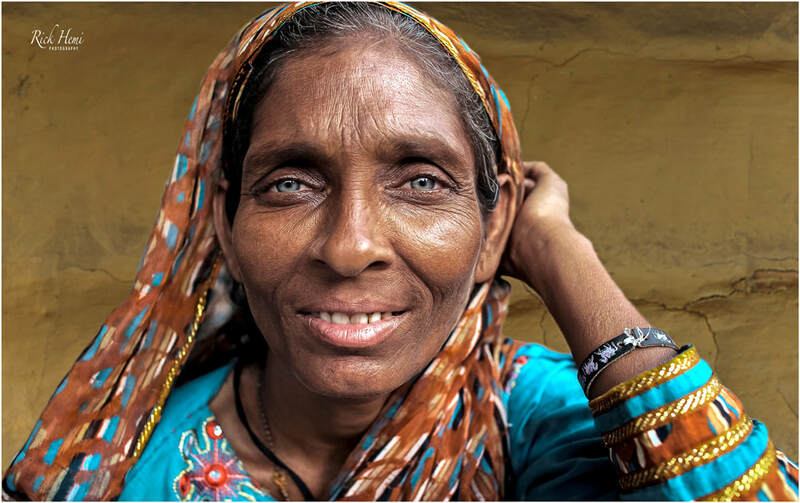 A random street capture of a colourful Bihari woman with hazel coloured eyes. A small amount of interaction time with her produced this image. 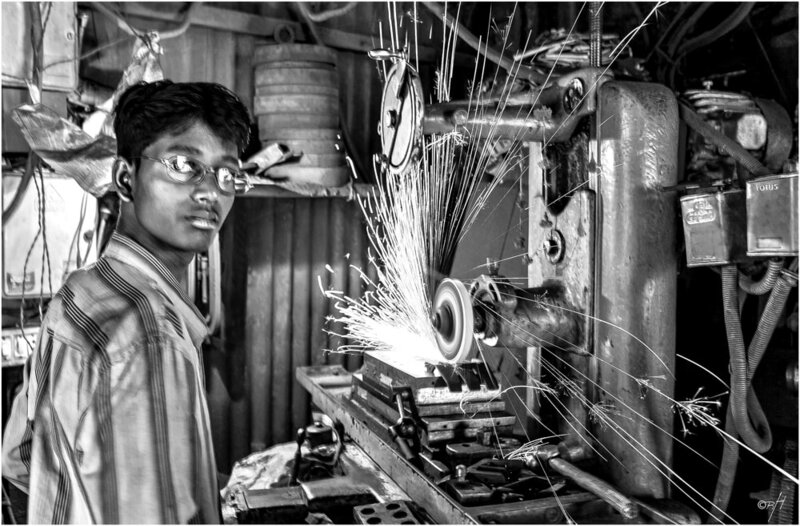 The ease of street photography in India is partially due to the large extent of social media sharing in the country. Almost every Indian has a cell phone and are accustomed like anywhere else on the planet to selfie addiction. 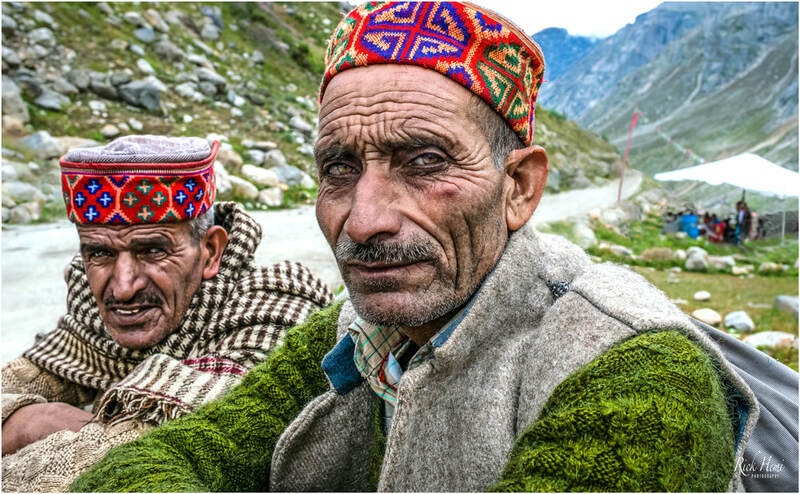 Indians have outward extraverted personalities which makes it even easier to photograph them. Breaking the shyness into bursts of laughter or to capture a serious look will depend on the amount of interaction. Taking colourful random street portraits can be captured with almost anything that clicks if using good optics. This image was taken in 2017 with a ten year old Nikon D3 12 megapixel body - using quality glass will produce great street snaps. In India wherever there's water - there's plenty of activity. From street hand pumps and rivers to any coastal shoreline Indians from all ethnic groups have their own individual needs that draw them to a water source. The best time for water activity is through the summer months in the early morning or late afternoons. 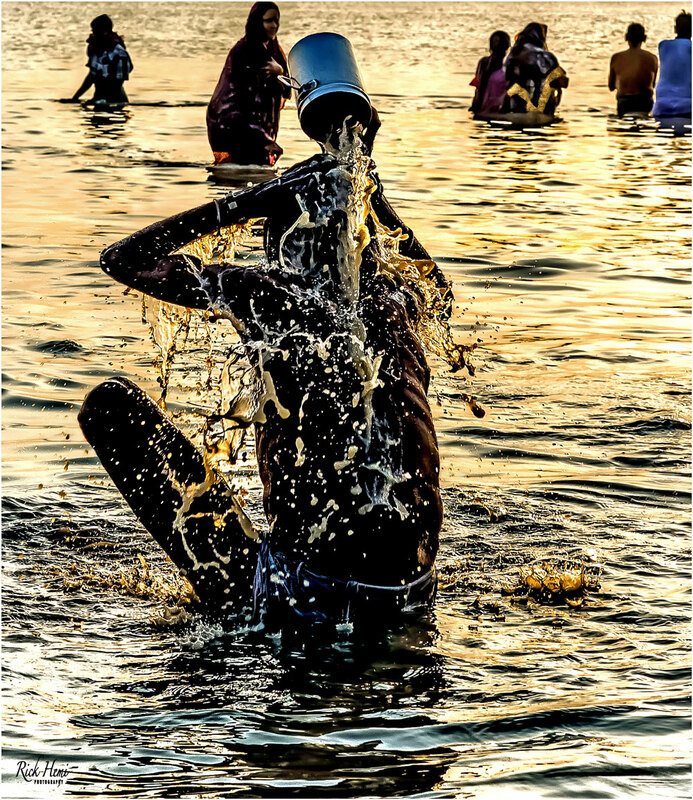 A solid splash capture into the Ganga during pre-monsoon heat. Taking mages like these can easily be done down at most ghats. 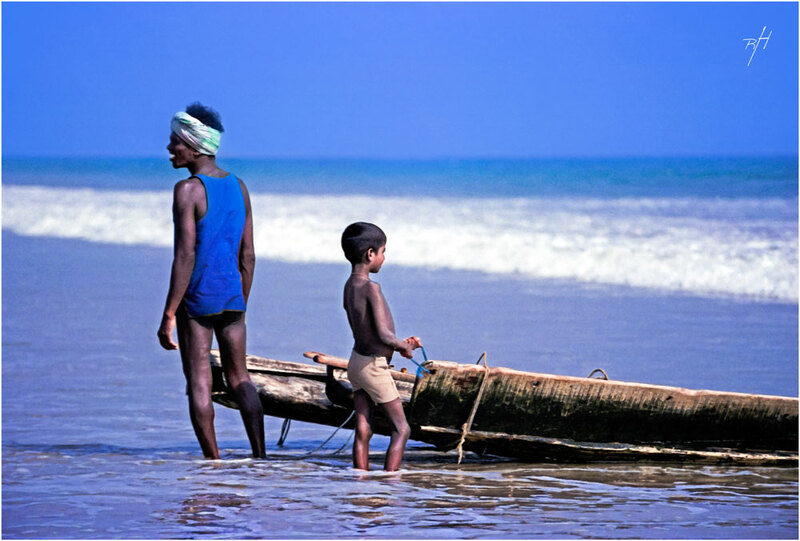 Locals bathing and washing along the shoreline is witnessed along most coastal regions of India. Small fishing village communities are plentiful and are great locations to photograph local lifestyles and culture. There's nothing better than having an ocean soak yourself during the pre-monsoon season. It's normal for temperatures to soar well into the high forties before the rains arrive. 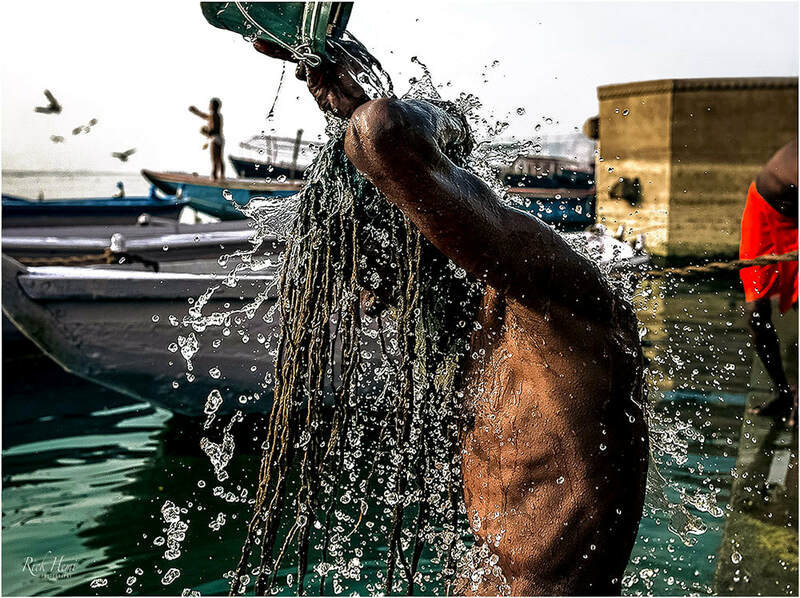 Capturing great images of Sadhus washing is simple enough, just head on down to any public Ghat and find them. The image capture above was taken using a classic Nikon D3S 12 megapixel body with an AF 28mm f/1.4D lens @ f/5, 1/2000 sec, ISO 200. 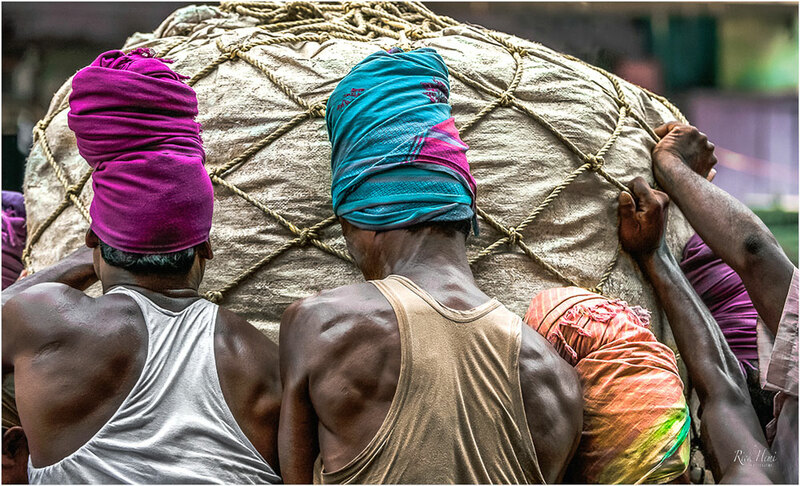 The below image was captured by chance down a side street in Calcutta. 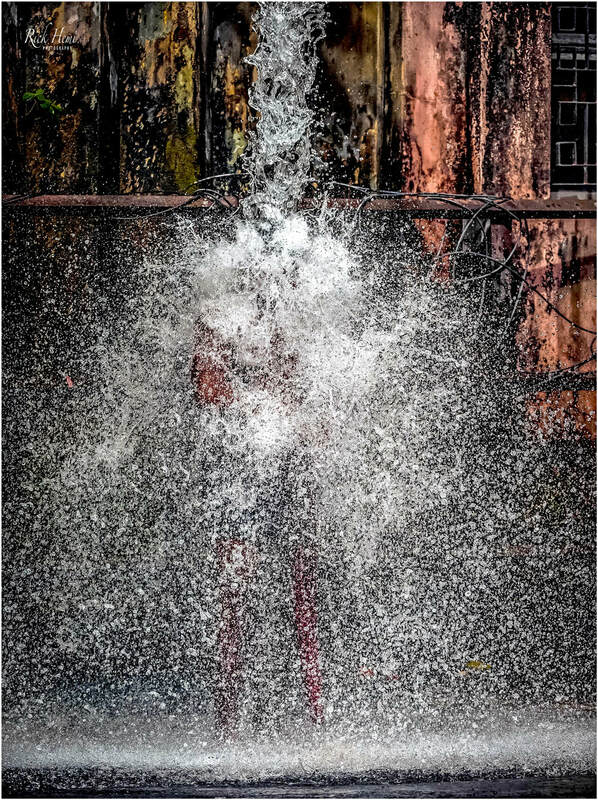 A local Bengali decided to take a shower under a water tank truck filling station outlet. The photo-gear at the time this image was taken had been mounted on a tripod approximately @ 50 metres distance. The simplicity of grabbing snaps along the Indian coastlines can't get any easier with the abundance of thousands of small fishing village communities scattered along it. Early morning or late afternoon are the best times to capture local fishermen returning with a boat load of fish. Some catches are sorted directly on the beach with the help of women and children from each particular village. The Tamil Nadu region is a good place to see this. A typical scenario of a fishing clan family crowding around pulled nets with assorted fish in the late afternoon along the Indian ocean coastline. Indian highland wilderness is never to far from the sweltering plains below. The choices of free camping and hiking where one wishes is spread through all the high altitude states and provinces. The chances to spot big cats like the snow leopard and puma is still possible within regions of Kashmir, Uttaranchal, and Sikkim states. Permits and entry fees are usually required to camp within national parks with varying fees from state to state. The views of the Himalayan chain from Darjeeling are spectacular with Kanchenjunga easily recognised from its 8586 elevation. When the heat becomes unbearable through the pre-moonsoon season, many retreat up to Darjeeling to cool off. Sikkim state is also close-by with road transport from either Darjeeling or New Jalpaiguri (NJP) direct to Gangtok. 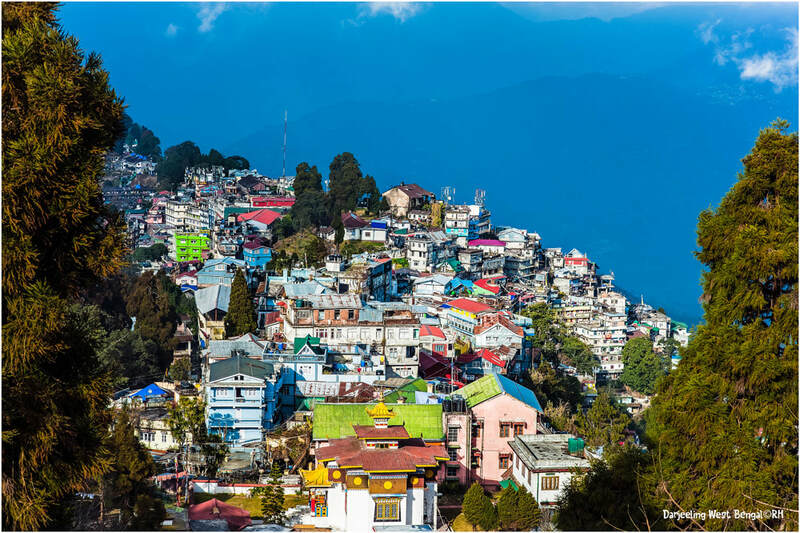 All foreign nationals will require a permit to visit Sikkim, which is easily obtained in Kolkata, Darjeeling or at the Sikkim border. There's no escape from rugged barren highland landscape throughout Himachal Pradesh. Isolated villages, and monasteries are easily visible and seen nestled through valley regions below most mountain passes. One certainly needs time and patience to hike, trek, and absorb the serenity and beauty of this wilderness plateau. When it's boiling hot down on the lowlands any of the mountainous regions nestled up along the Himalaya are a perfect retreat to cool off, hike, trek, and chill for a few months. Leh, Manali, Darjeeling, Gangtok, and Thimphu are just a few out of numerous mountainous townships worthwhile visiting. Many different types of landscape topography formations can be seen throughout India. 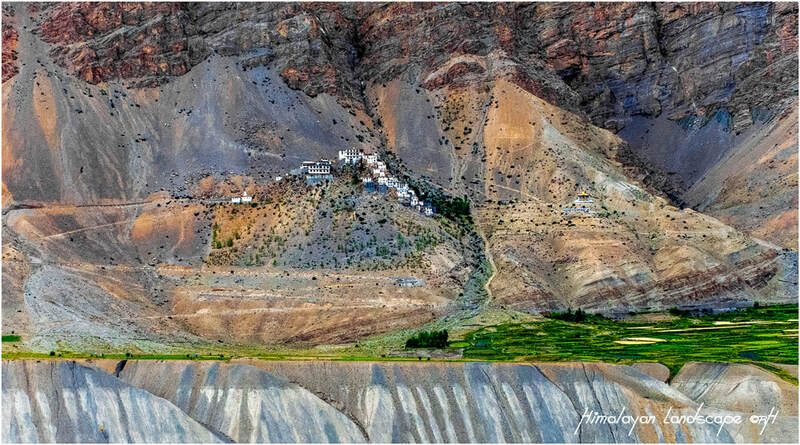 Some of the most spectacular formations are within the high altitude regions of Ladakh and Spiti valley. 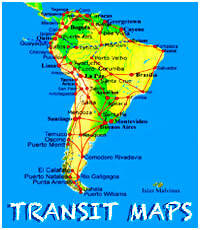 The best time to travel and transit through these areas is before, or after the winter months have finished. Road closures commence as early as October, and remain closed until April. The only transit route that's open to Spiti valley during winter is via Shimla. 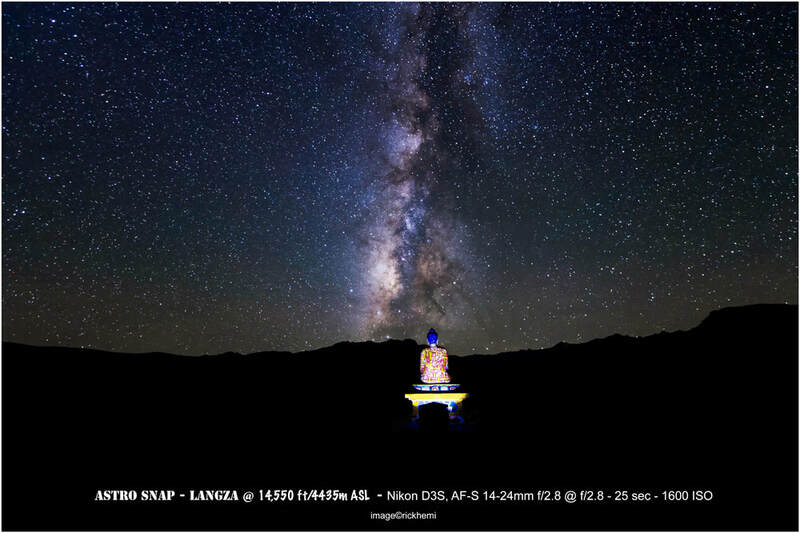 India has an abundance of different regions to capture the Milky Way. The mountainous regions of West Bengal, Kashmir, Himachal Pradesh, and the desert environs in Gujarat are a few examples that have open spaces with clear skies to view and capture awesome Astro snaps of the Milky Way rising and moving across the night skyline. A tripod with a camera using the delay timer settings is required for hands free captures to avoid any vibration. This image looks as if was taken relatively close-up, but it was captured from 5o+ metres using a Nikon AFS 200-400mm f/4 G VRII @400mm on full frame mounted on a tripod, and then re-cropped to 1/6th of it's original size. Capturing snaps of locals can't get any easier than down at any washing ghat using a lens that has some reach without disturbing the subject. 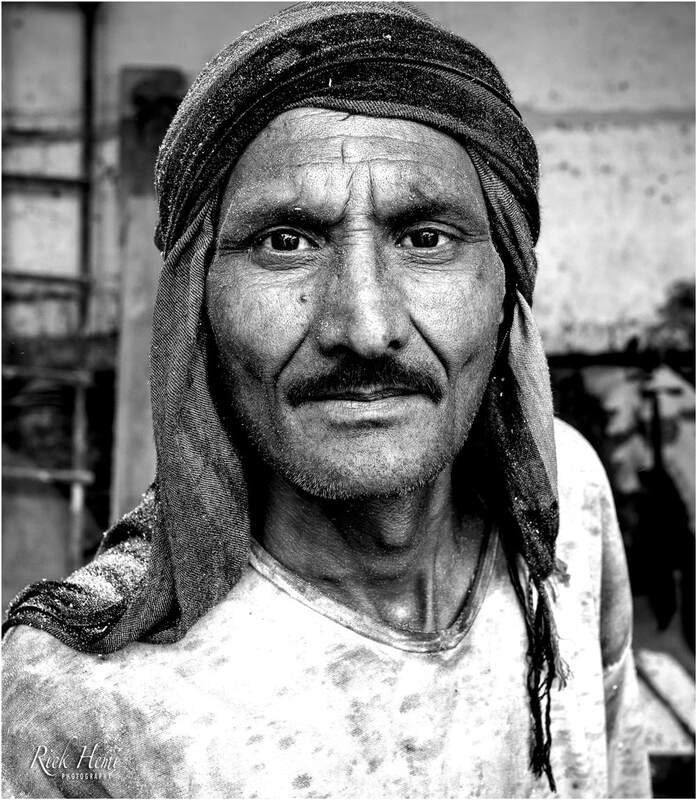 Interacting with Indians is key to capture street portraits. Spending a short time interacting with locals will eventually pay-off with some great snaps. Most street photographers have their own technique how to get the attention of subjects to look in the right direction before taking an exposure. I noticed on this last trip through India (Feb 2018) observing tourists photographing Indians and had found one thing in common with most of them. Foreigners use zoom lenses to capture their snaps keeping their distance well away from the subject. Personally, I do the complete opposite when a subject looks intriguing, especially locals with strong facial features. I will normally get up as close as possible using a fixed focal prime lens (24/28mm) to grab the snap. These two images are examples that were taken using a 28mm on a full frame body. These two locals were randomly captured with a short duration time of interacting with them before approaching close-up with a 28mm lens. Some form of photo-gear is required in all wildlife parks and sanctuaries in India if you're wanting satisfying image captures. Most wildlife spotted are usually at long distance which can be normally captured using a tele, or a zoom lens of 200-400mm. Smaller bird parks through the migratory season like the Kulick bird sanctuary will get you very close to open bill storks hatching their eggs. Larger parks use their own open air transport trucks which may or may not give good results on any particular day. Returning the following day may give positive results to see a bengal tiger, or a leopard close-by napping up a tree. At the end of the day it's timing and luck that counts, but don't expect using a smart phone to get satisfactory images. 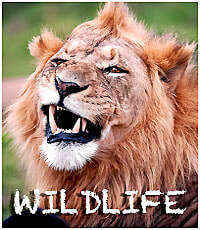 Wildlife parks and sanctuaries are scattered far and wide throughout India. 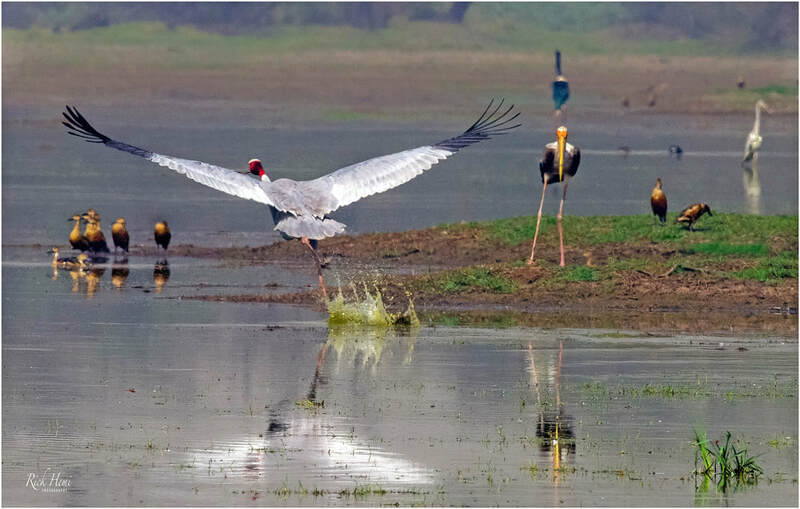 From Gujarat to the north-eastern states local species of wildlife remain in their habitat and are seen all year round. 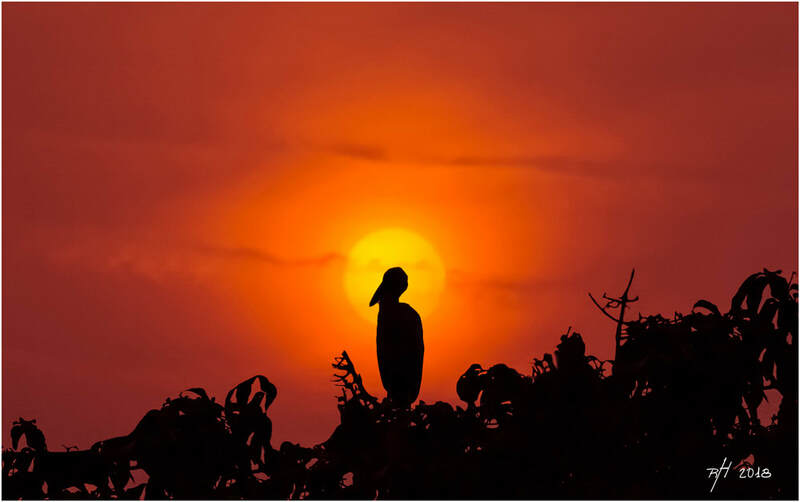 Migratory birds from other continents arrive by the thousands through the start of the winter months that begin as early as October and remain till late March. Large cats like the snow leopard, puma and bengali tiger can still be spotted within certain isolated regions, although the timing and the amount of days within one area to see such large cats must be taken into consideration. Getting close-up images of large carnivores usually requires time and patience, but wherever there's a carcass, or a feeding ground is where eagles and vultures gather and feast together. Both captures above were taken at a distance without disturbing them, by using a Nikon 800mm f/5.6 manual focus lens mounted to a tripod. The enjoyment of watching and photographing birds of prey in the wild is possible in northern India during winter. Spotting Bengal Tigers in national parks will depend on location and movement of these big cats on the actually day of entering a park. Local park guides are usually familiar where tigers are situated, but there's no guarantee to get up close, unless tigers are near the road sides or at watering holes. One can be fortunate enough to spot a few big cats through the day at any of the major wildlife parks that have them. A second or even third visit to the same park may be required to capture reasonable close-up snaps like the above. 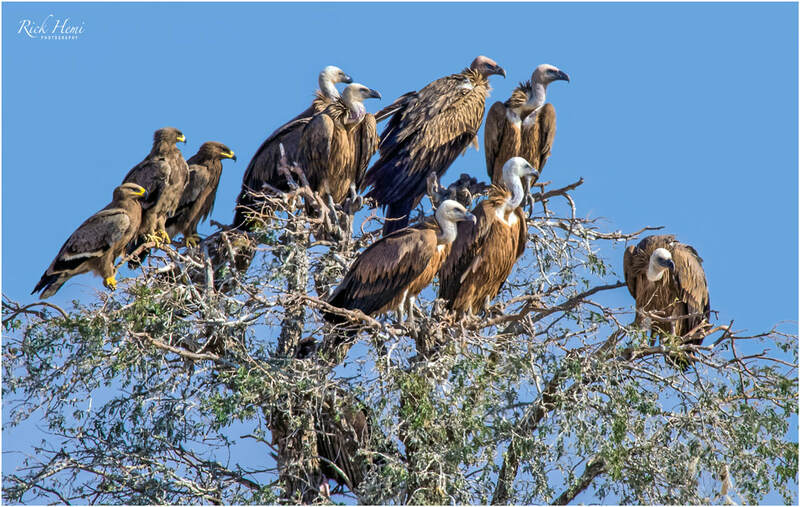 Below image, a mixed group of Steppe Eagles and Griffon Vultures sharing the same tree waiting to feed on a carcass. They can be spotted within wildlife's parks, or in the northern regions of India. Sikkim also has many awesome wildlife reserves with trekking and camping routes. One requires long lenses that can reach out to capture images like the above. 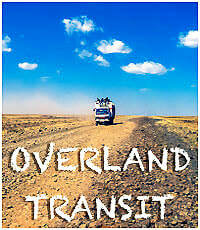 More overland travel wildlife images can be seen here, and the photo-gear page maybe worth a look. Vultures, eagles and snow leopards can be spotted within the Indian Himalayan, although flocks of vultures and snow leopards are harder to find unless a food source attracts them to a certain location. It's actually more luck and by chance to see vultures and eagles feeding on a carcass in national parks, or beside highways. The first signs of a feeding frenzy by carnivore birds is by their circular rotation in the sky. Using a pair of binoculars to scout locations is beneficial and recommended to pin point the drop and take-off zone. The snow leopard during the winter season can be seen in Ladkah and Spiti regions with some patience, but don't expect snow leopards to be roaming around in droves - they are known as the white spotted ghost cat. Coolies can be spotted in and around vegetable and produce markets. They're known to lift and carry loads of up to 1 tonne (6-8 coolies together). The image captures were taken from a distance using the aid of a tripod which is recommended for various types of street photography in busy bustling areas. Finding a location to set up a tripod can be a mission for the right viewing angles, but in most cases it is possible. A tripod will usually enable a 360 degree hands free rotation resulting with crisp tack sharp images. Getting up close photographing coolies will reward you with some great looking captures. The best time to find a bunch of them lifting and carrying heavy loads is usually around mid-morning outside market areas where trucks are off-loading their produce. Capturing portrait snaps of them on the fly between loads is possible, or even better during their smoko and lunch breaks. 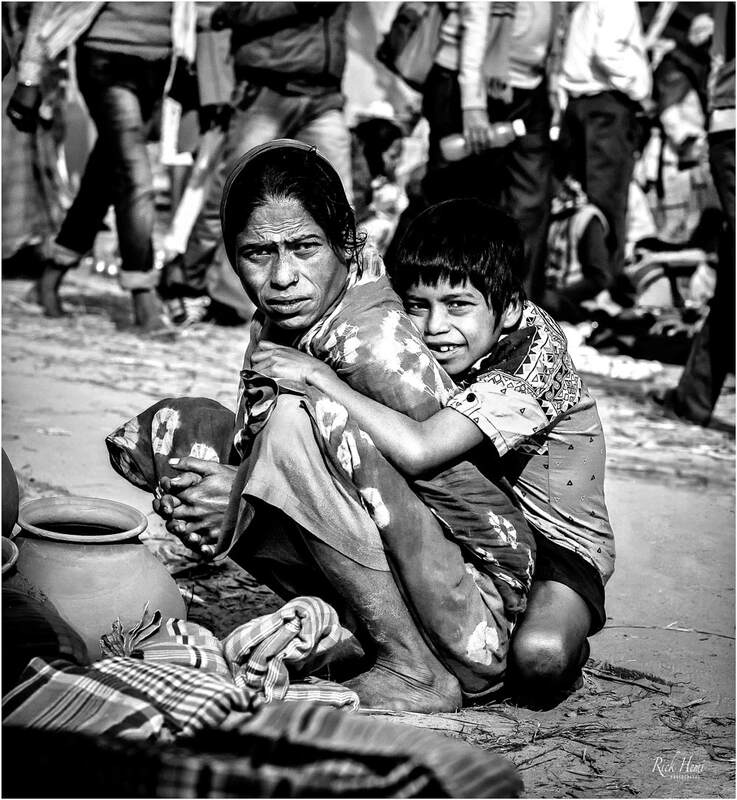 Capturing snaps within bustling market areas is like a gold mine. Indians from all walks of life pass through markets to shop, mingle, congregate, and fossick around. 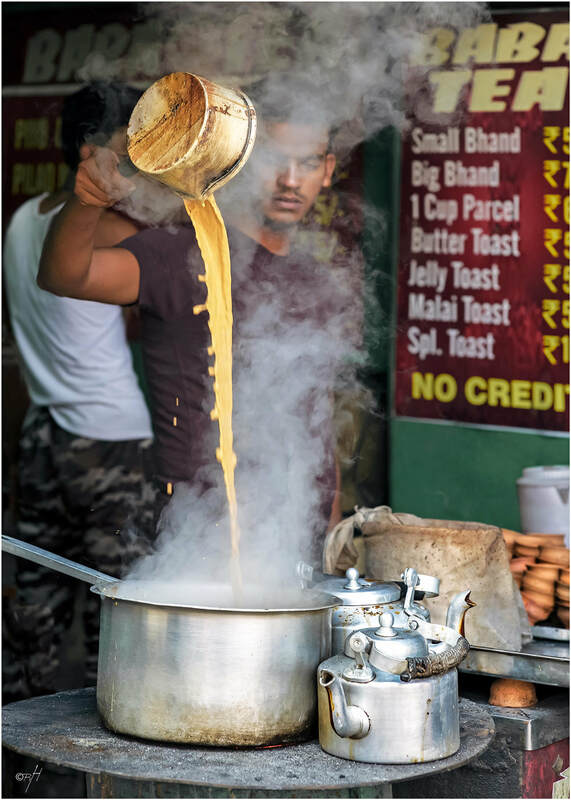 One place inside most markets that can get good results, is wherever a chai stall is. It's here where locals have time to sit, chat, and fire up a bidi. I normally chill out here and sip on a chai or two myself. Small tight laneways are always buzzing with a mix of different vibrance that catch many unaware of what can materialise from one second to the next. 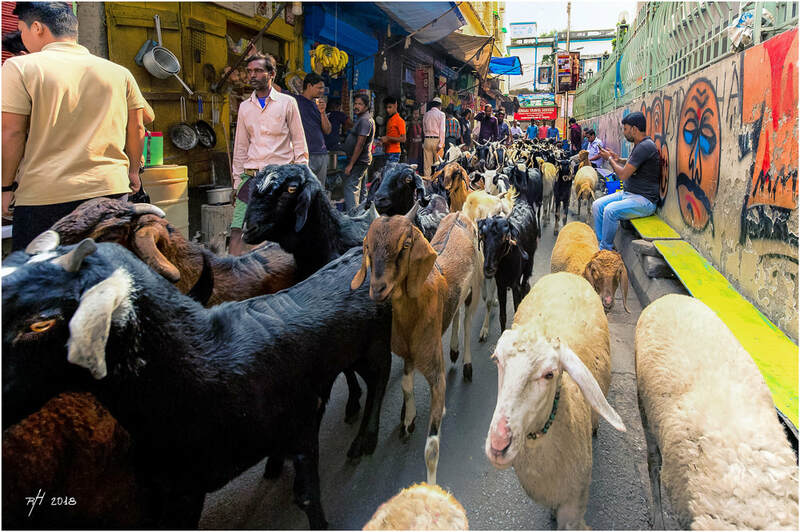 A flock of sheep and goats heading to market down this particular laneway is certainly one of those memorable moments to witness in real time. Capturing images like this can easily be done if some form of photo-gear is already in hand to use, although there is no exact timing when something like this may occur. This is a small part of the magical experience through India which makes it a country well worth exploring in slow motion. 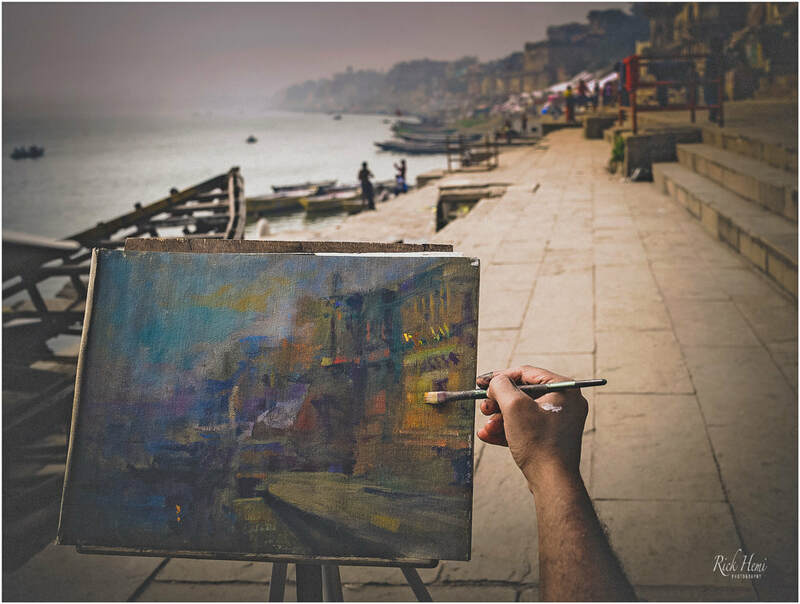 India is recognised as one of the top countries globally for all types of photography. It doesn't matter what your photographic fetishes are - India has it all. From random street captures, and festivals, colonial and cultural architecture, ancient historical sites, and desert landscape, including tribal zones, mountainous regions and wildlife, which are all spread across the country. 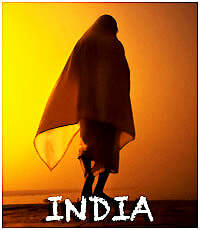 The best time and season to transit through India is during the cooler months from November through to February. If the heat isn't an issue, then anytime of the year will work in your favour. Humidity before and during the monsoon season will harm camera lenses if they are not protected with silica gel, there's more on this in the Photo-Gear page. The above images reflect the power and presence on both sides of the lens. These pilgrims were captured using fixed prime optics. 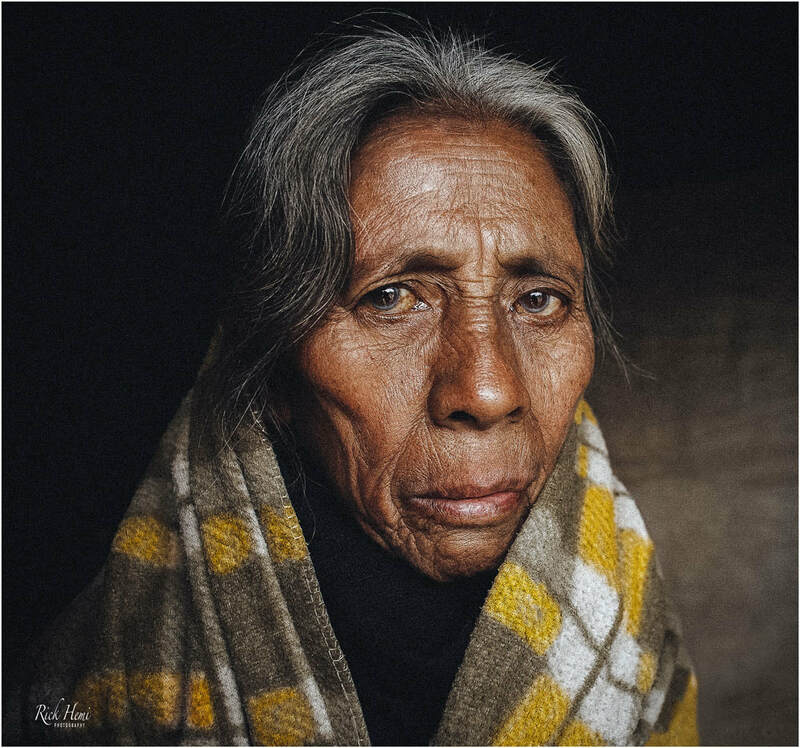 A side profile of a tribal woman from the north east captured on the street from long distance - the lens was mounted on a tripod. Everyday out on the streets in India is different from one day to the next, and yields all different types of moving subjects and random captures as you wish. Carrying extra SD/flash cards and back-up batteries is recommended to cover an entire day of street photography. The image above was a random street snap that was taken on tripod while panning around looking for other subjects within a busy area. A variety of lenses with different focal lengths is recommended for India. Some will probably disagree, but the majority of street photographers around the planet do use their own pick of prime and zoom lenses. The images through most of this website were captured using 6 different Nikon lenses i.e. AFS 14-24mm f/2.8, AF28mm f/1.4D, AF 85mm f/1.4D, 105mm f/1.8 AIS MF lens, AFS 200-400mm f/4 VRII, and an 800mm f/5.6 MF tank. A cell phone or point and shoot is better than nothing, but certainly not enough scope or the legs to reach out when necessary. Quality 2nd hand optics can always be purchased through eBay. 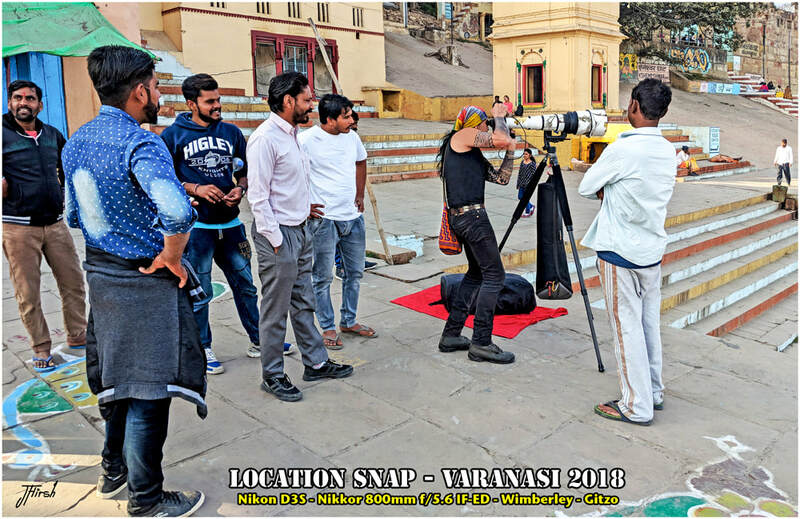 From coast to coast, north to south, India will keep any street photographer busy flat out capturing random snaps of locals from sunrise to sunset. 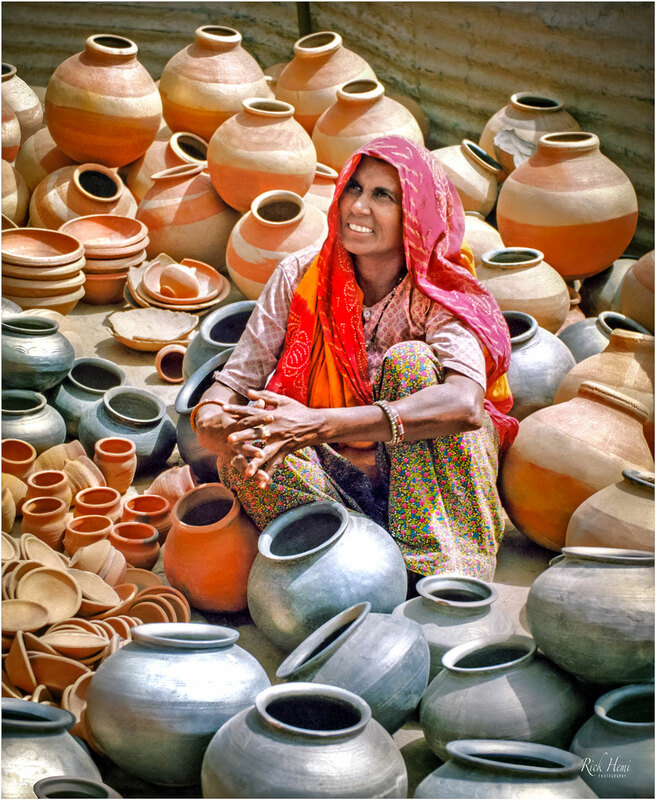 Clay pottery is seen scattered across India in all shapes and sizes. It's impossible not to spot a pile of stacked terracotta pots against walls, or spread along pavements near bustling market areas. Even when purchasing a chai from most street vendors, it's usually poured into mini clay cups. Fresh curd is also packed in clay vessels. Chai and curd vessels are generally used only once and then discarded. The abundance and usage of large cast iron and alloy kettles is nothing new in India. Classic designed kettles are still being made and manufactured as they were 100 years ago without alterations in their sizes. Cast iron kettles are easily seen steaming away on open fires in mountainous regions, or perched on various coal ranges among the thousands of street cafes within large cities and villages. 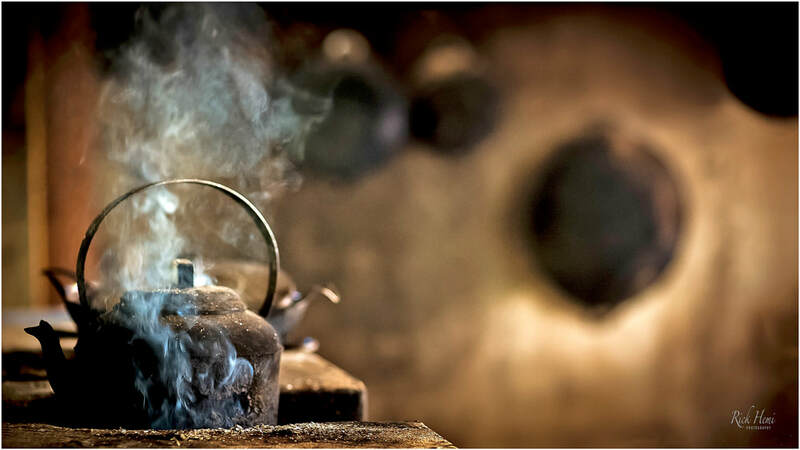 Indians in general have had a long historical chai addiction which makes it easy to understand why the ionic open fire kettle is still being used today. 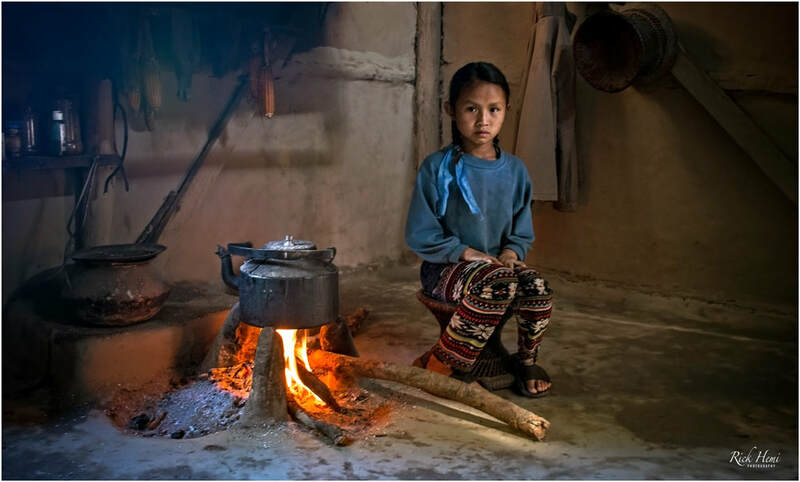 Coal and wood is easily sourced throughout the country, which allows most rural dwellings from Nagaland in the east to Gujarat in the west to have at least one large kettle steaming away ready to use. 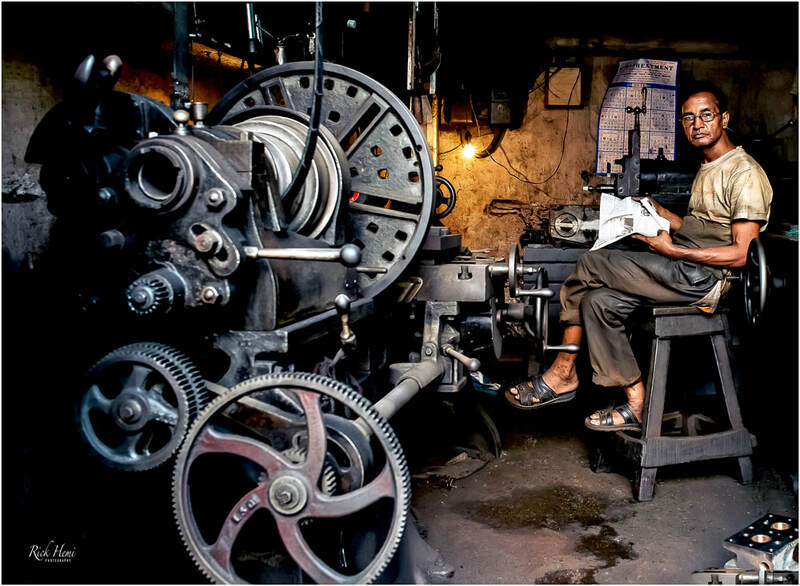 If you're into machine shop photography, then there's plenty of different types of workshops that can be found scattered throughout most cities in India. Small lathe and milling workshops are usually found within the industrial areas of town. This is also the same location where one can find automotive and welding repair workshops for trucks, buses, and cars. In some cases, asking permission to photograph first is recommended. There are industrial sites that prohibit any type of photography - don't cross the line or suffer. Entering into any machine worksop while machinery is operating is entirely at your own risk if injury or damage to photo-gear arises. Below, welding can be seen at most automotive workshops where trucks, and trailer units are being repaired. 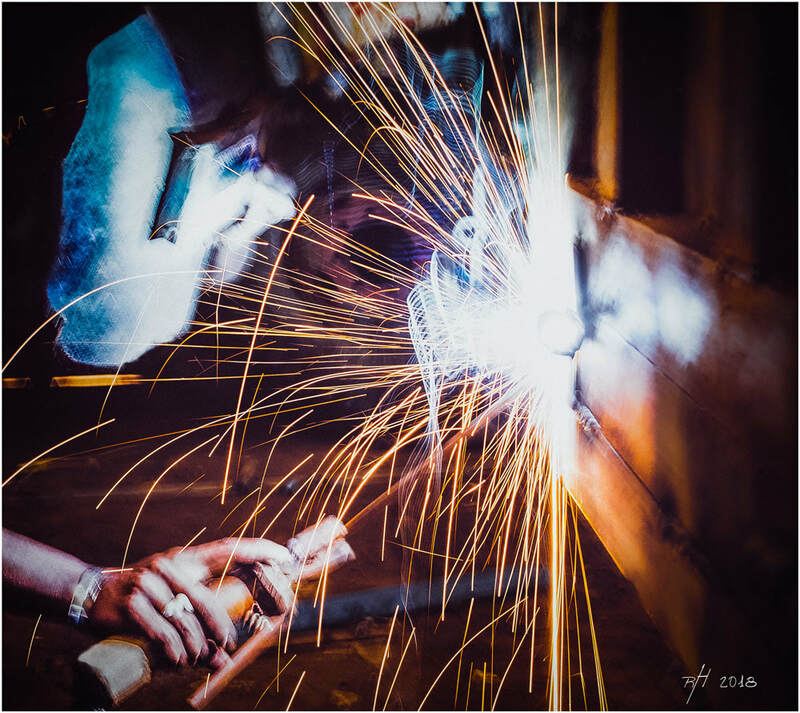 Usually there are no restrictions to photograph welders in motion, although this will depend on each workshop with their own rules and regulations. Wearing a dark pair of shades is advisable, and to allow free space for the welder to continue without interrupting his workflow. 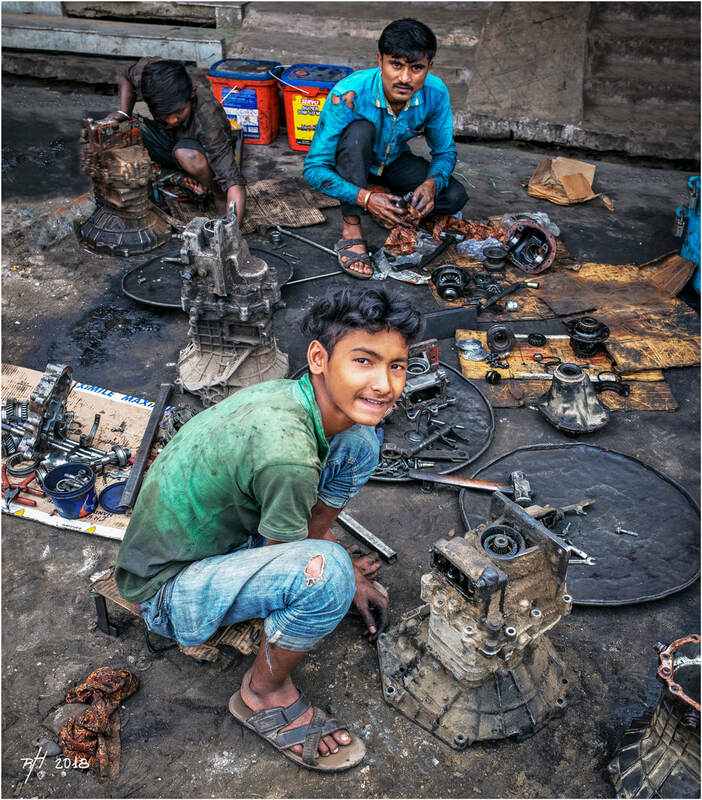 Below, street mechanics play an integral role across India, the dismantling and renovation of engines, transmissions, and diffs from all types of vehicles is visibly seen in most towns usually in one certain area. Some of the easiest locations are in smaller villages along main highways at major junctions. With a small amount of interaction, images like this can be captured without any issues - a round of chai for the mechanics will be appreciated. Leather items like fashion foot wear and custom belts all have their own authentic designs through each state. A pair of custom handmade leather shoes can be made to order in a day or two. 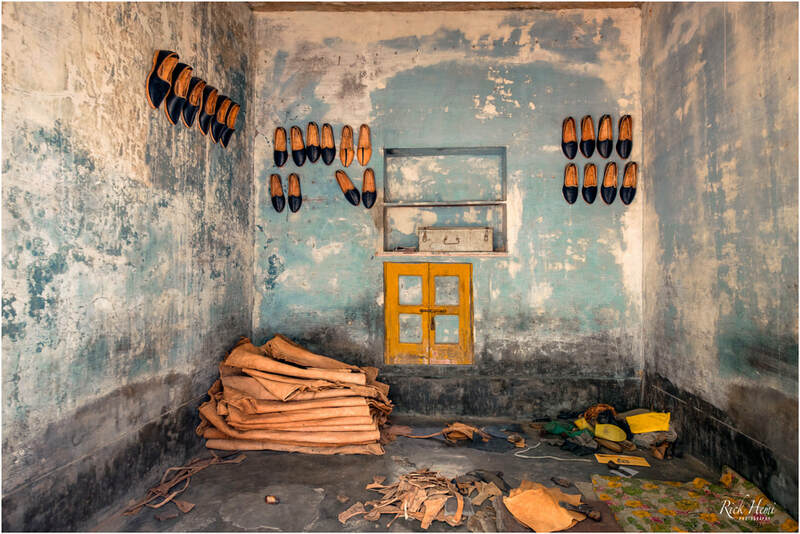 If you're in to hand made leather work, then India probably has something that will catch your eye. 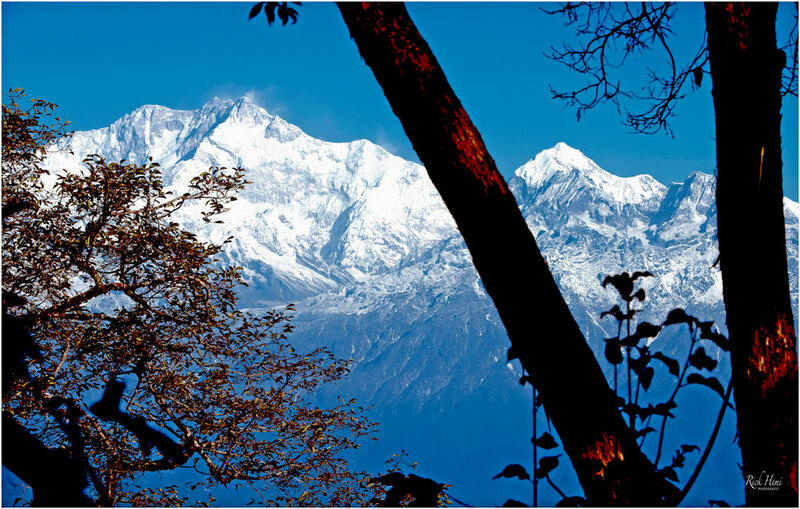 Trekking to Sandakphu is one of the quickest hikes in India to view the Himalayan mountains. At an elevation of 3700 metres Sandakphu summit gives a spectacular panoramic view just like an open amphitheatre of the Himalayan chain, which includes Mount Everest, the 3 sisters, Lantang and Kanchenjunga. Rising early before sunrise will give the clearest views before hazing occurs. Sandakphu is situated on the tri-borders of Sikkim, Nepal and India. 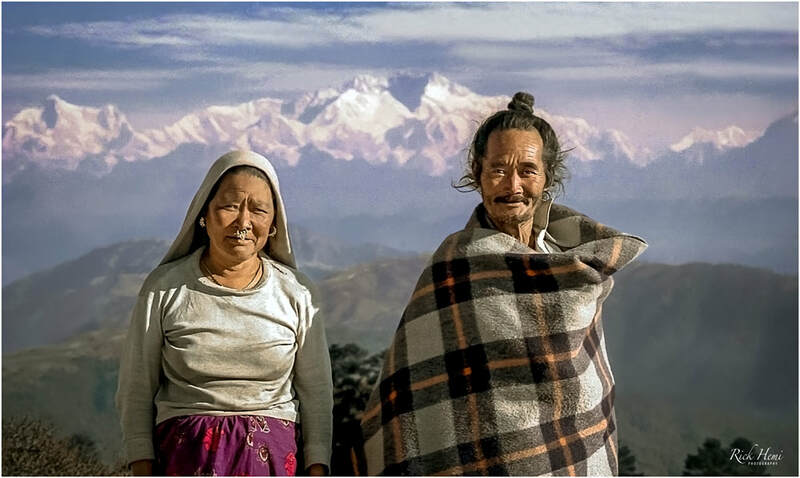 The above snap of a local couple was taken at the summit with Kanchenjunga in the background. 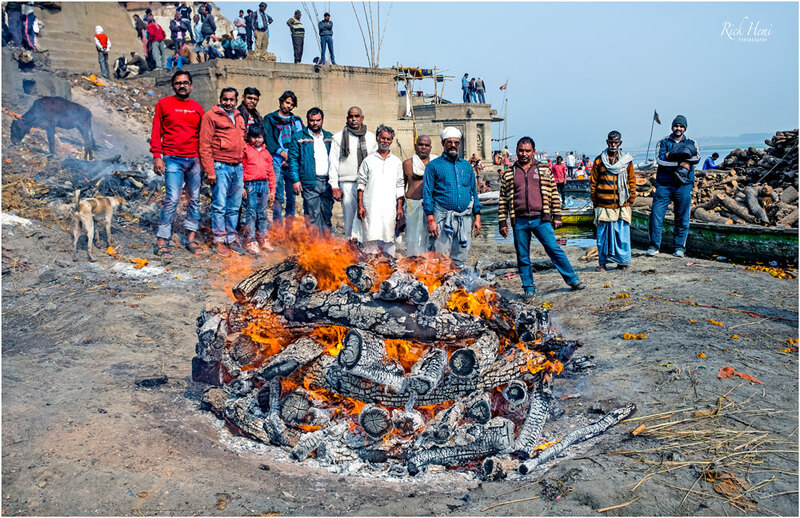 Visiting the cremation ghats in Varanasi is a common event amongst most foreigners. There are no issues watching the cremation process with a variety of different viewing points. Many take an early morning sunrise cruise along the Ganga in a dugout passing close-by the cremation ghat. One of the main issues with foreigners are those who have no interest in the cremation process, and only visit briefly for 5 minutes to grab sneaky snaps, and then cruise off. There is a "mafia" of locals who keep their eyes on those who do this, and do pounce on foreigners neglecting respect. The last image above was taken with no issues whatsoever, because of the interaction with the family, and showing respect during the cremation process. 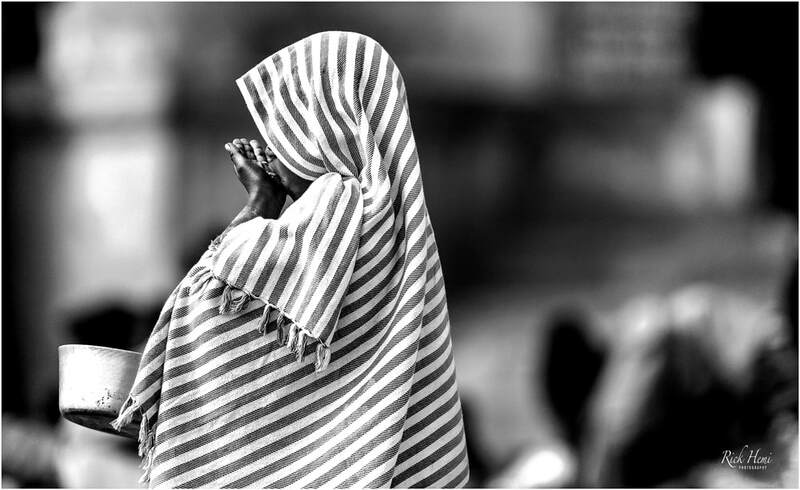 Capturing random snaps of Hindu pilgrims in India is a large part of what most foreigners enjoying doing. This local had shaved his hair to signify a death in the family. This is a tradition that dates back centuries and visually witnessed throughout India. A very common event that's seen along the river banks throughout India are locals who earn a wage washing clothes for customers. Ghat washing is usually by beating clothes, carpets, and linen to death, and then sun drying everything to a crisp. The best time to enjoy watching and grabbing a few snaps at the same time begins around 8am through the winter season. 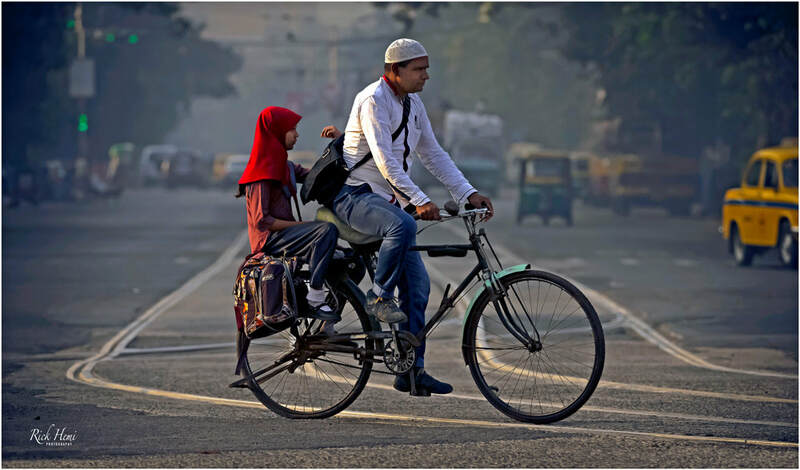 Novices in quick pace captured on a street in Calcutta. They are a part of the missionaries of charity congregation established in 1950 by Mother Teresa. Random street photography in India will keep you busy all day and most of the night no matter what city, village, or region you're in. A normal procedure after taking close-up snaps of locals is to show the image capture before rushing off - which will be appreciated. There are instances, and encounters when some Indians will resent being photographed, which is usually recognised immediately and should be respected - Don't push your luck just because you want a particular image of someone. If crossing the boundaries, then expect an aggressive response back without mercy. In general, most Indians are very photogenic, and don't mind to be photographed. In some instances, asking first before snapping close-ups maybe required. Personally, I've always found interacting first with locals is the key to capture candid snaps of people no matter what country it is. Randomly photographing women in India will depend on their status and cultural practices. Some elderly woman won't hesitate being photographed while others are extremely suspicious having a lens pointed at them. This solely depends on each subject, and the amount of time, including how many captures they allow before saying enough is enough. Showing the image capture to the subject will give positive results usually with a smile of appreciation. Everyday out on the street in India is different from the previous without seeing the same faces. The options and opportunity for random street portraits are immense without the complications that are seen in western countries. 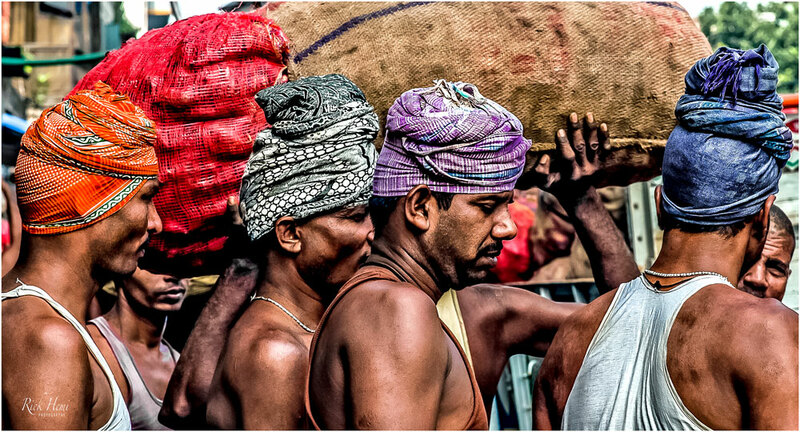 Travelling through India still offers the freedom to photograph as you wish without having to look over your shoulder. 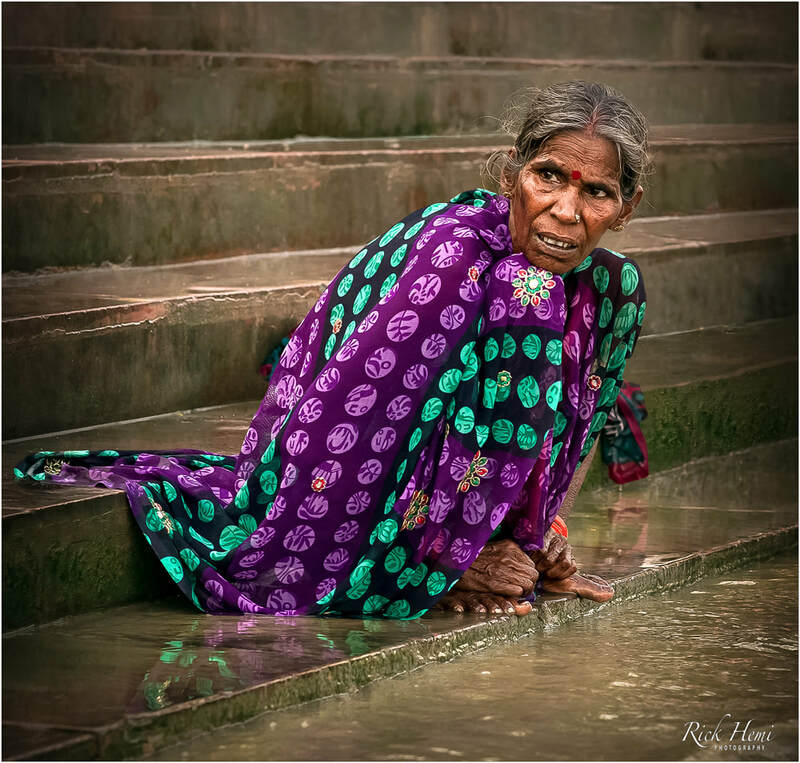 In most cases locals will scratch their heads wondering why a foreigner took a street shot of an old woman. I've lost count how many times I've seen Indian guys going out of their way to have a selfie snap with western woman. Have you ever had the urge to photograph a particular stranger on the street, and regretted not doing so? Many foreigners make the same mistake with various reasons why. It maybe because of low interaction levels, shyness, or the humility of being denied, and screamed at in public. If you were to sit in a busy wholesale market area to watch locals interact with each other, you'll notice very quickly they all have similar levels of Interaction. They may scream at each other with humorous chit-chat or argue to the extent of boiling point without crossing the line. A foreigner in the middle of all this will probably think twice and hesitate to grab close-up snaps, because of their western way of thinking it may be inappropriate, or could result in a negative outcome. In most cases this never happens. Street vendors, market sellers, and the majority of locals are quite flexible if someone wants a close-up portrait of them. Don't think you're the first person that's captured a street portrait of a particular subject. You'd be surprised how many times certain subjects have been captured with a lens in the same location over period of one or two decades. So, if there's an urge to capture someone close-up, it will depend on your interaction level, and how much you want the photo. 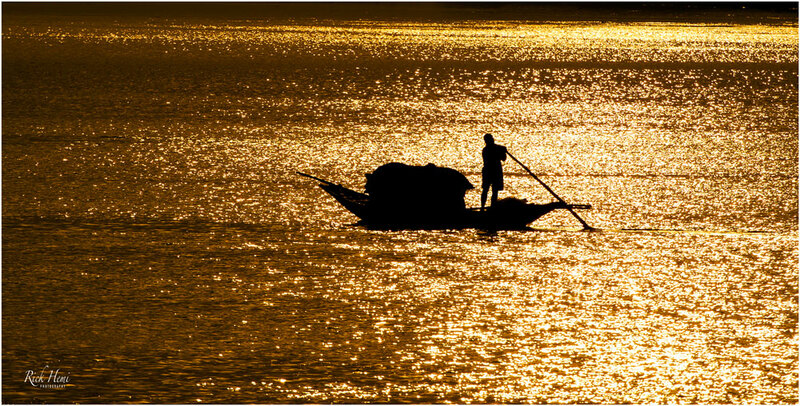 Hiring a boat at first light is normal procedure among the thousands of locals and foreigners visiting Varanasi. 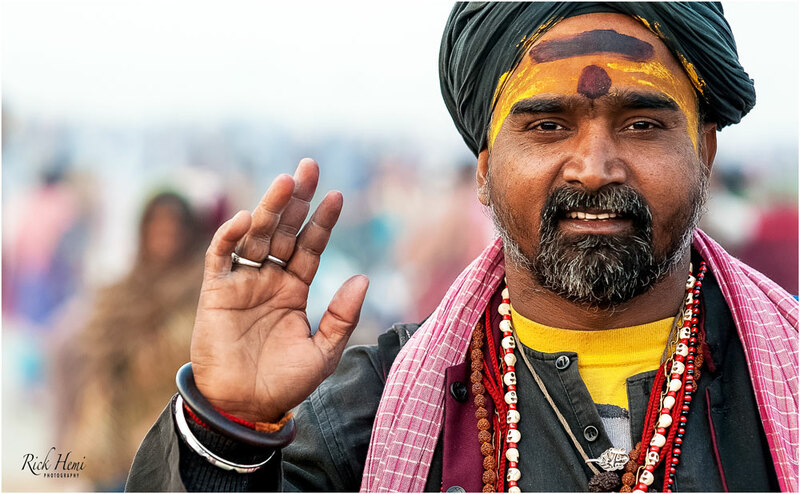 Finding a sadhu to share the journey up and down the Ganga is another option for those who want to push the limits of inspiration to the next level. 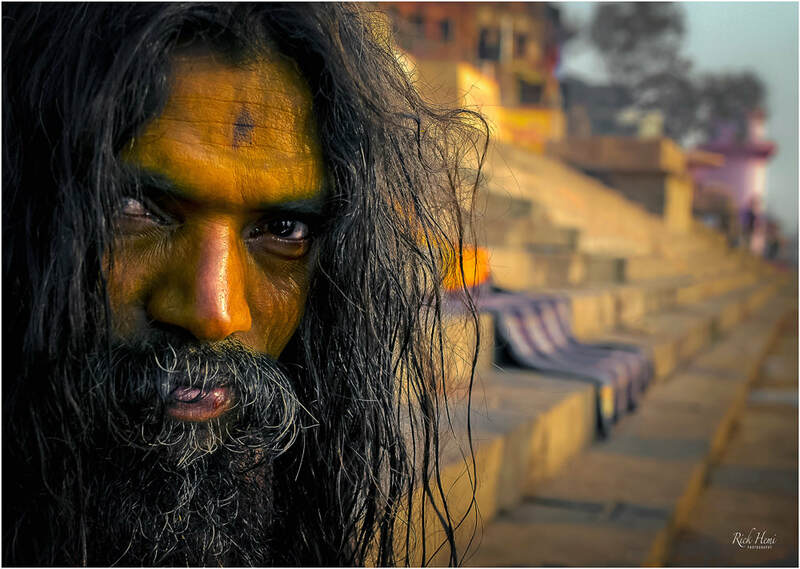 Finding a sadhu at 5am in the morning for a few hours is virtually impossible. 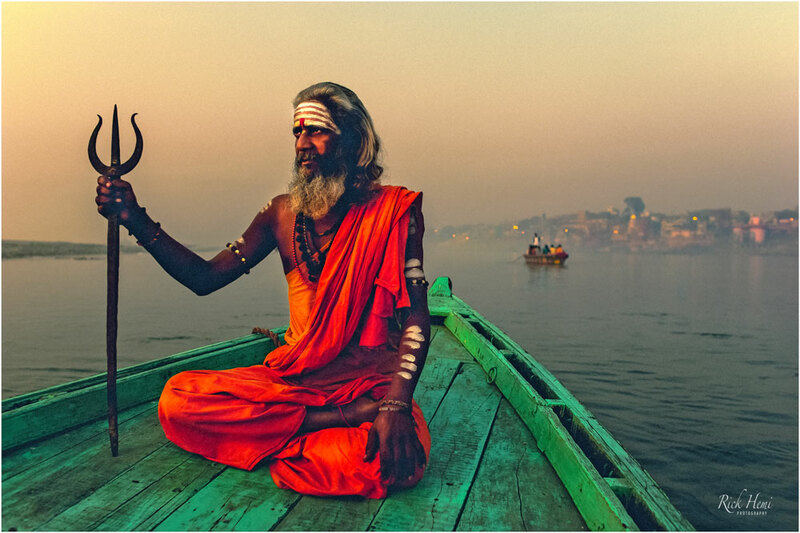 Arranging a time and place can easily be done the night before - Bartering an hourly rate with a sadhu is interesting. Camels are still being used for labor work pulling cart loads of hay, or other agricultural produce annually. This is mainly seen in Gujarat and Rajasthan states in the west. 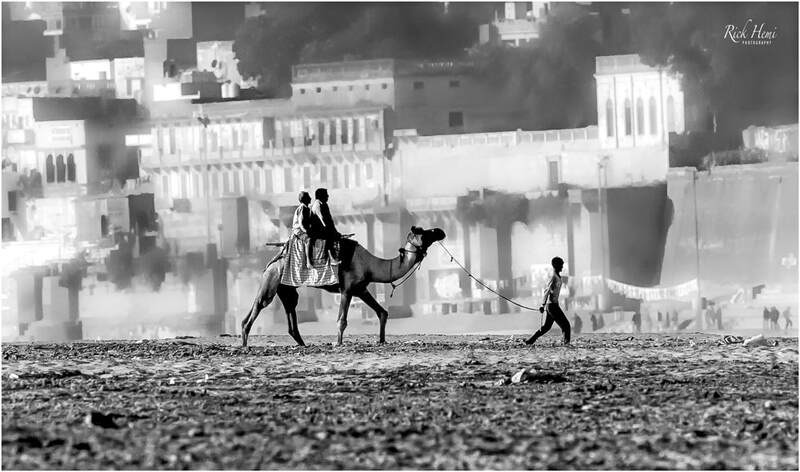 Some lucky camels are used for tourism purposes in the Thar desert with transit journeys from Bikaner to Jaisilmer. 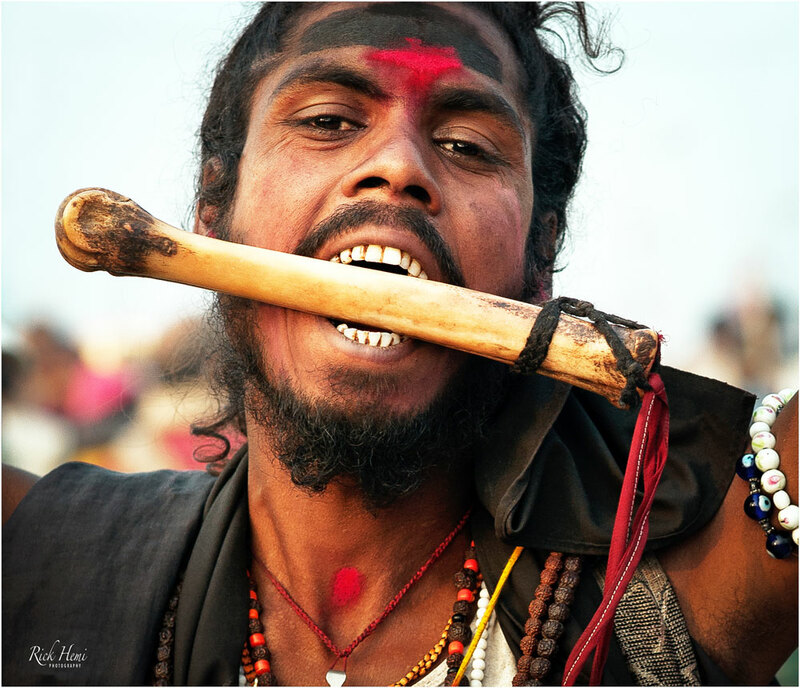 Most Aghori can be easily identified by their dress wear which is usually black cloth, human arm or rib bones bones, and human skull necklaces. 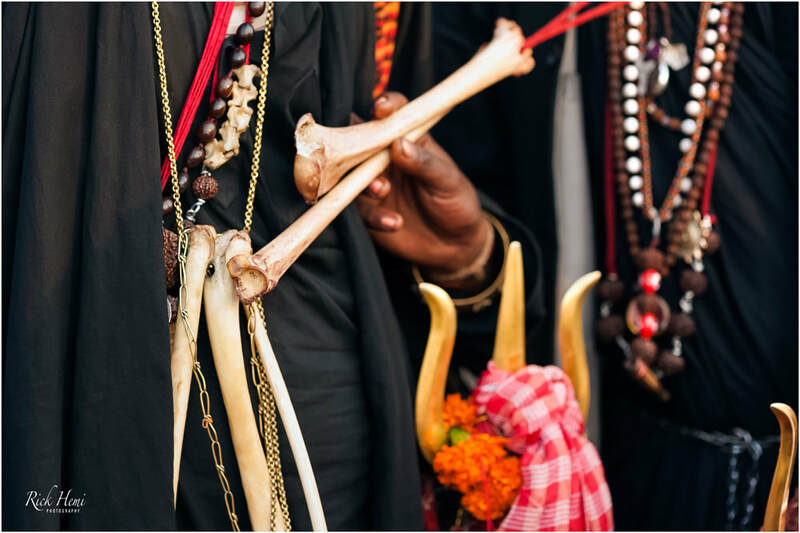 The image above shows Aghori sadhus revealing a partial display of human arm and rib bones retrieved from cremation sites and used for rituals. 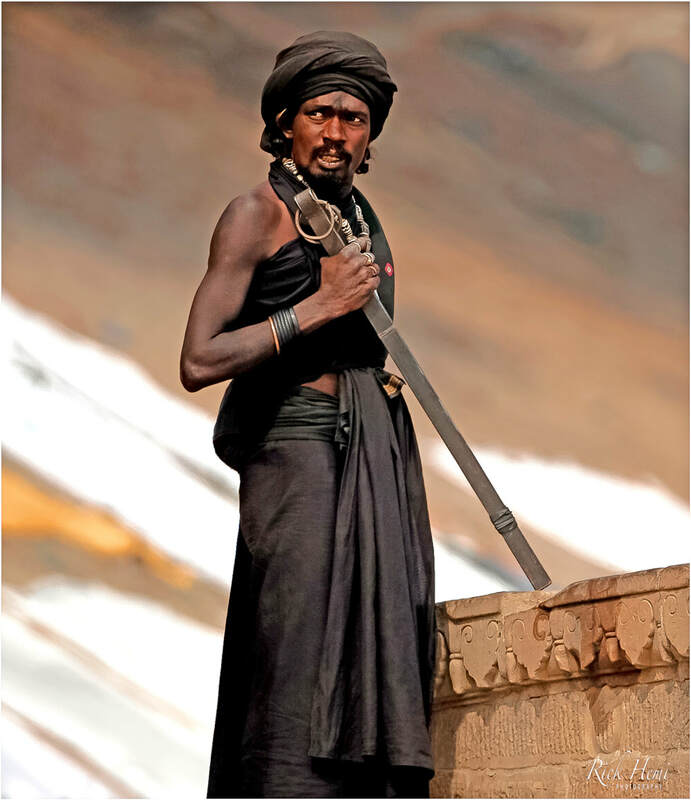 A long shot capture of an Aghori dressed in black cloth wearing a bone necklace adorned with miniature human skulls. 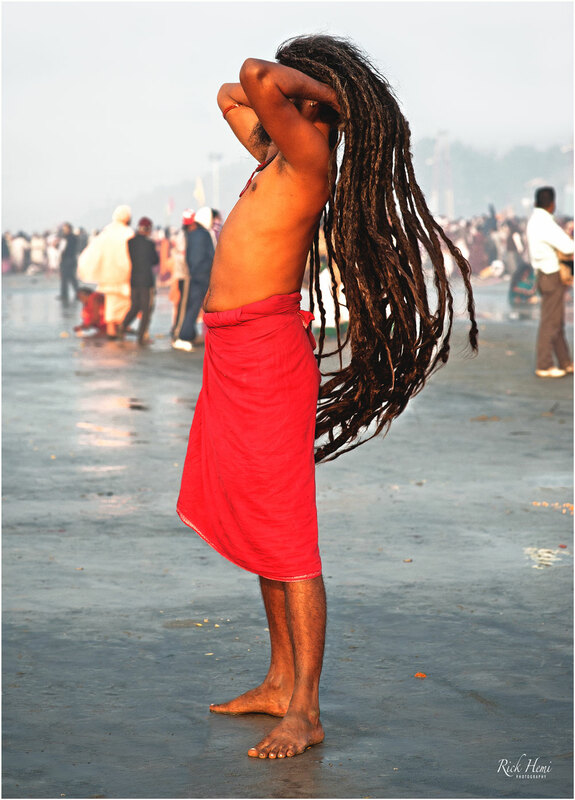 The Aghori sect are the most respected of all Sadhus, and live in a life of celibacy. 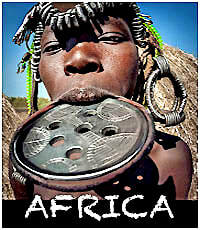 They are known for their bizarre religious rituals which are associated to forms of cannibalism. They include group night rituals of necrophilia, and perform other rituals using human bones, and skulls. 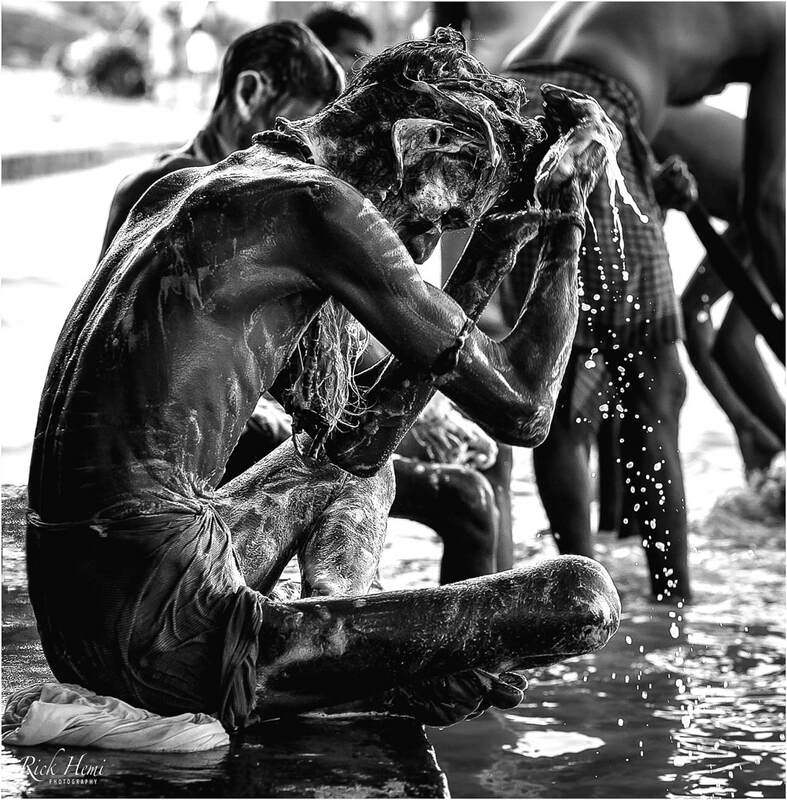 Aghoris also consume anything, which includes all types of faeces, human fluids and human flesh. By doing this they gain awareness of the oneness of everything. 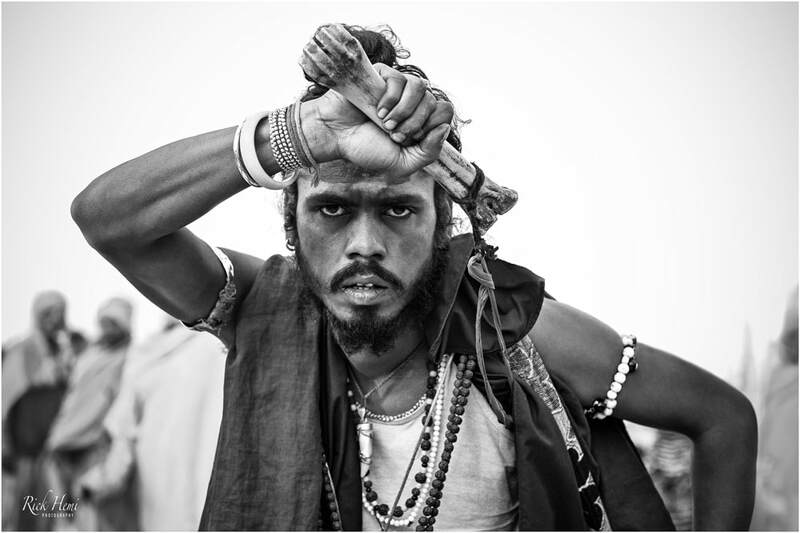 Photographing Aghori can be a mission, and isn't recommended unless they allow it. Aghori can become very aggressive with those who pursue to pass the boundaries of grabbing snaps without contributing a cash pay-out. They may also place a voodoo curse on those who push themselves to grab snaps without permission. Graphic image captures of Aghori cannot be posted on this website due to full genitalia exposure. Aghori have a nasty temperament and shouldn't be approached unless you can handle their voodoo rituals, curses with human bones and nakedness. If you have browsed through other pages on this website, you'll notice that 99.9% of the images have been captured using natural ambient light. I've never travelled with, or owned a flash, but in saying that, there have been instances when a flash with a diffuser would have been beneficial for some captures. 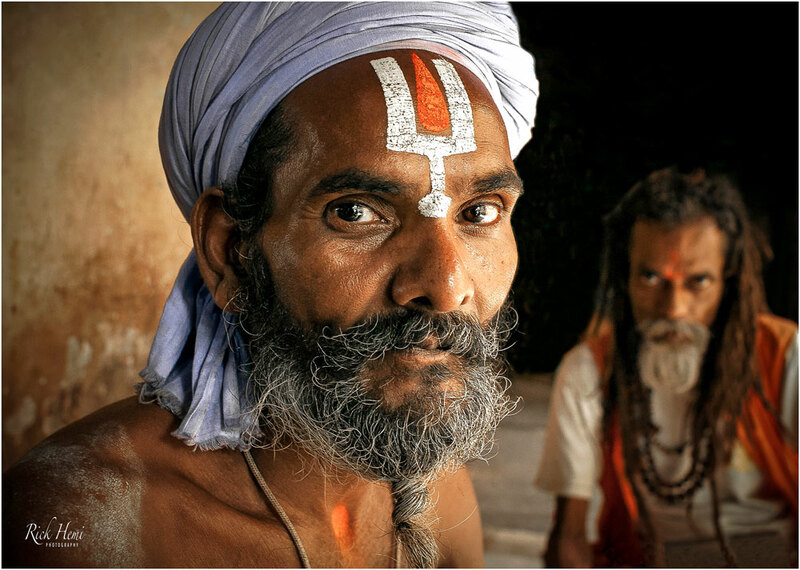 The problem that may arise using a flash, is when photographing Sadhus in almost dark or subdued light. Their composure, depending what state of mind they're in will probably cause different responses to a bright flash. 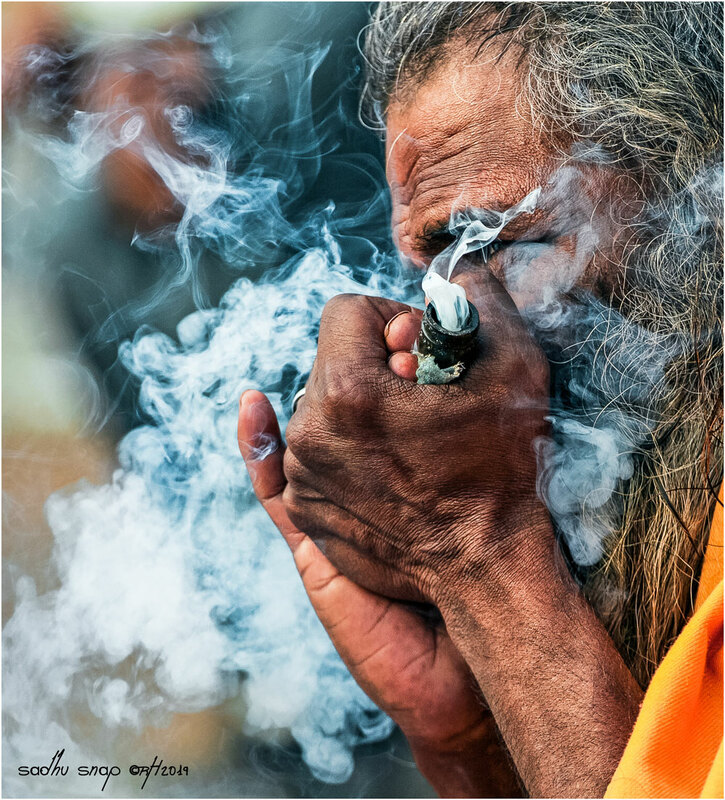 Sadhus who are high on ganja or hashish are normally very chilled and relaxed, so you can imagine when a flash is fired off in the face of a Sadhu in this state of mind. You may get one capture, but forget about grabbing anymore. Both above and below images ware taken in low subdued light using no flash. Spotting temples, and monasteries is easy - just look in any direction, and one won't be to far away. That's something India isn't short of. 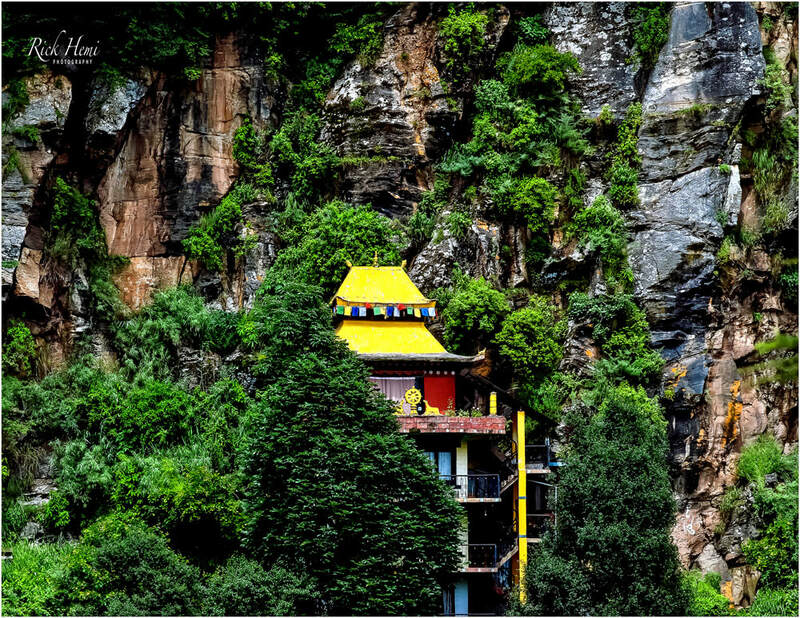 Up in the highlands of India Buddhist temples are seen nestled at the bottom of a large cliff faces, and on the top of mountain passes. Ladakh and Himachal Pradesh states are well known for their abundance of mixed monasteries and temples. The below snap of this historical Mogul icon still remains the same today as it was in this image taken over 3 decades ago on a first visit to India. 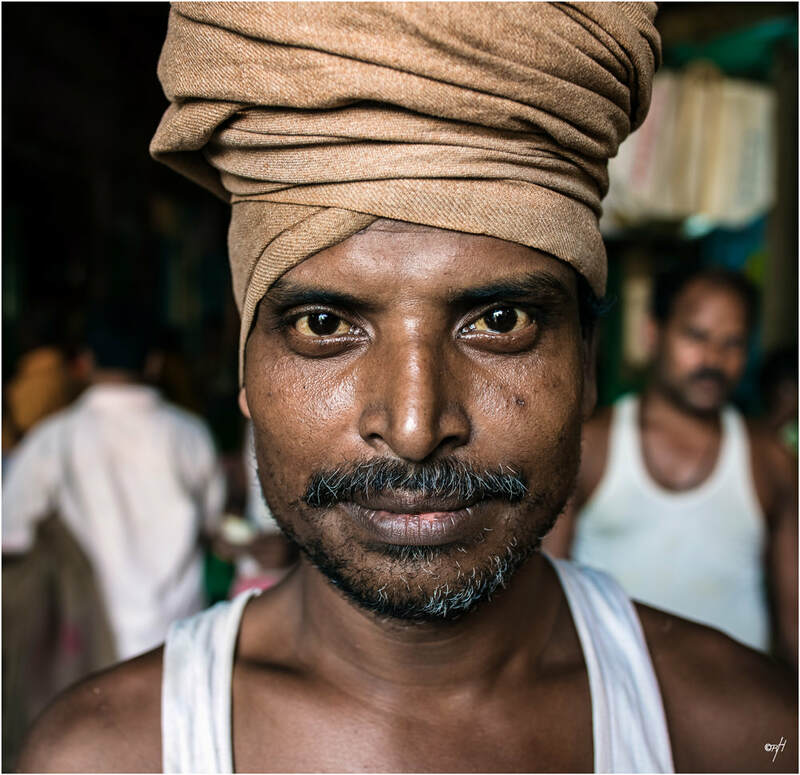 Taking street portraits of locals anywhere in India is rewarding. 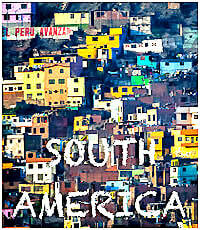 Some great places to begin are within, or around bustling city vegetable markets, or industrial areas. Most markets will keep you busy snapping images for hours, and at times all day, and then returning again for another fix. River estuaries, canals, and fishing docks are also excellent places to capture portrait snaps. 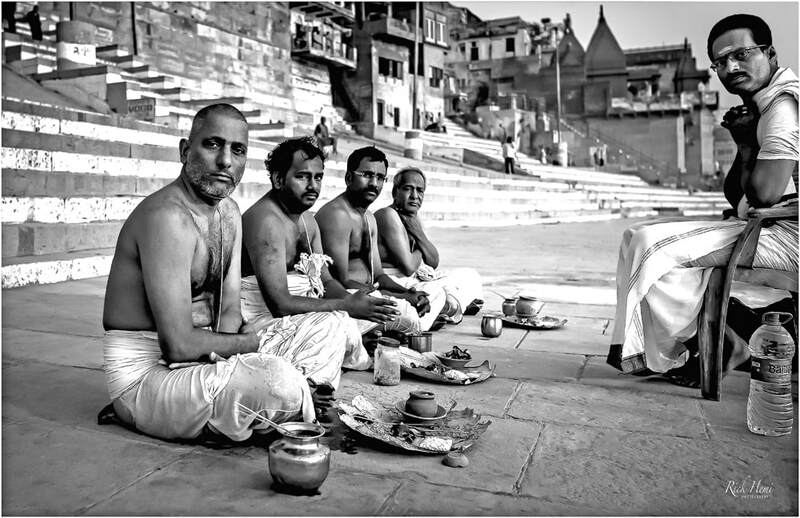 This street snap also looks good in colour, but even better in black & white giving strong contrasts of direct contact to the faces of these locals, The majority of Indians today dislike black & white images thinking it's a by-gone error in photography. You never know who you'll meet on the street who looks unique in their own way just like this Punjabi Sikh who had no issues for a quick close-up. In the heat of summer family groups can be seen together relaxing in shady areas cooling off from sweltering heat interacting amongst themselves. An image taken inside a semi covered bustling vegetable market. 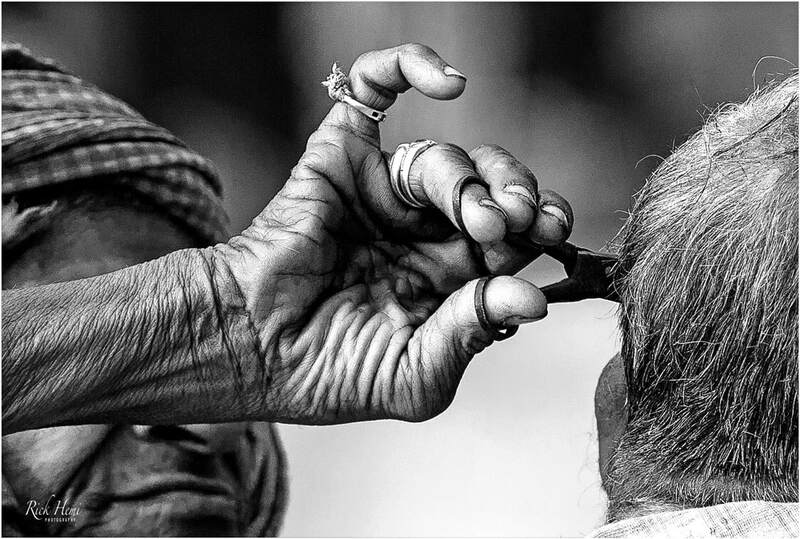 Indian markets are always rewarding to capture close-up portraits without any issues. Turn around snap captures are always good, because no matter who the subject is, their eyes will always be wide open when swinging around to look. 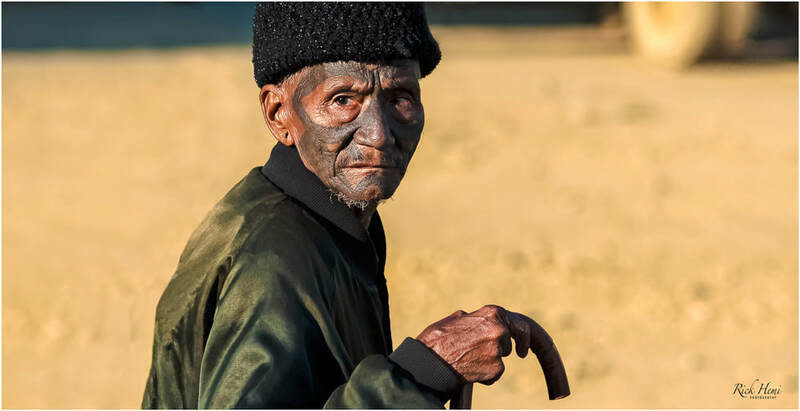 Old, young, male or female - it doesn't matter, locals in general do enjoy being photographed. Some interaction with chit-chat will go a long way. 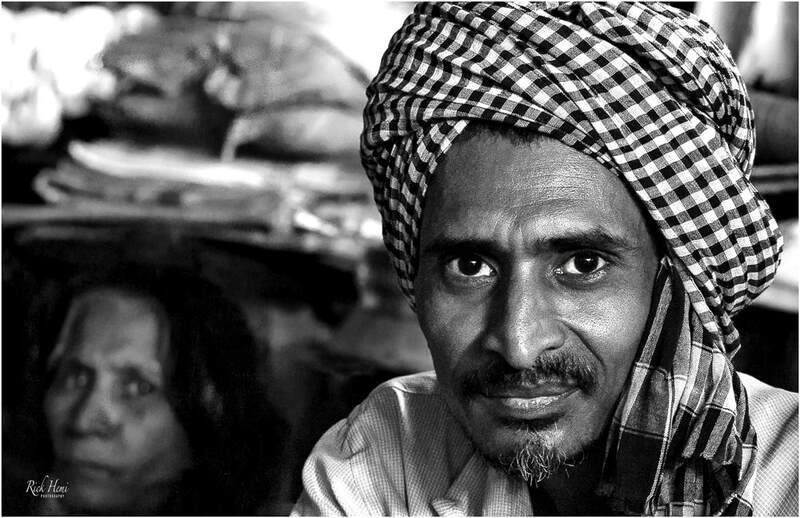 Taking portrait street snaps of locals will keep anyone busy on any journey in any direction through India. Forget the selfies - they're worth a dime a dozen. Some of the most positive looking images are those taken randomly on the street of total strangers. Many foreigners avoid doing this usually because of introverted shyness that stops them from doing it. My advice is to use the art of interacting with strangers at any busy street chai stall where there's a lot of hustle and bustle of different locals constantly passing by. There's more chances of capturing an image of someone who may sit for a quick 5 minute break before disappearing, which may give the option of capturing a perfect in focus street portrait to be proud of. Brushing up your interactiong skills is a priority for capturing random street portraits in any continent. If you're shy, or come from a country where people are afraid to speak with complete strangers, to start-up conversations with particular people, or have a general anti-phobia towards weird looking strangers - you have a problem. Opening yourself up towards strangers will depend how infected you've become. For instance, I used to spend time with friends in Sweden, and found it almost impossible to interact, and speak with Swedish people at bus stops, public parks, and train stations. I found it frustrating, but certainly relieved I didn't have the same symptoms. People who have their eyes glued to their smart phones walking down the street without noticing what's around them are just as bad or even past the limit of complete self-introversion. Capturing close-up random street portraits begins with interacting with the subject. No interaction will get you zilch, and probably a taste of inner disappointment that will continue if it's not healed. The most negative reaction one can suffer from any basic chit-chat with a stranger is a polite NO to photograph. This does happen, and should be respected, but in most cases the chances of capturing close-up portraits of strangers is positive - Try it! The serpent snake is well embedded into ancient Hinduism mythology and considered to be divine. 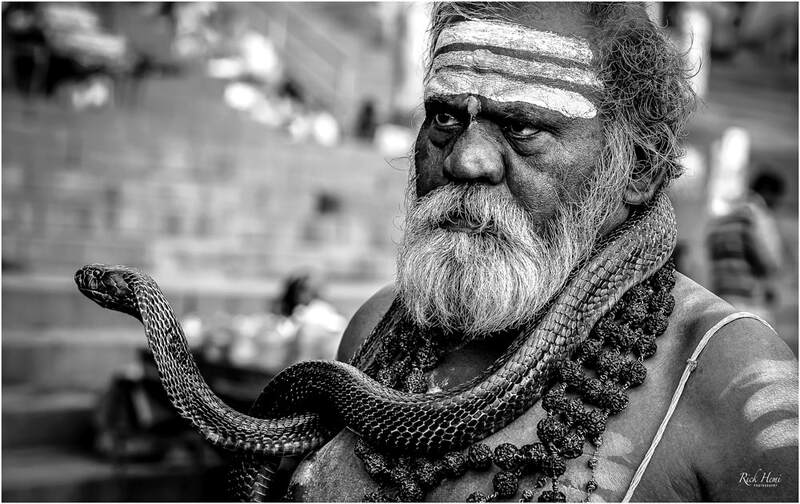 The image above showing a sadhu with a cobra reflects this. Nagpanchami is celebrated every year on 30th of July with rituals to the snake god. 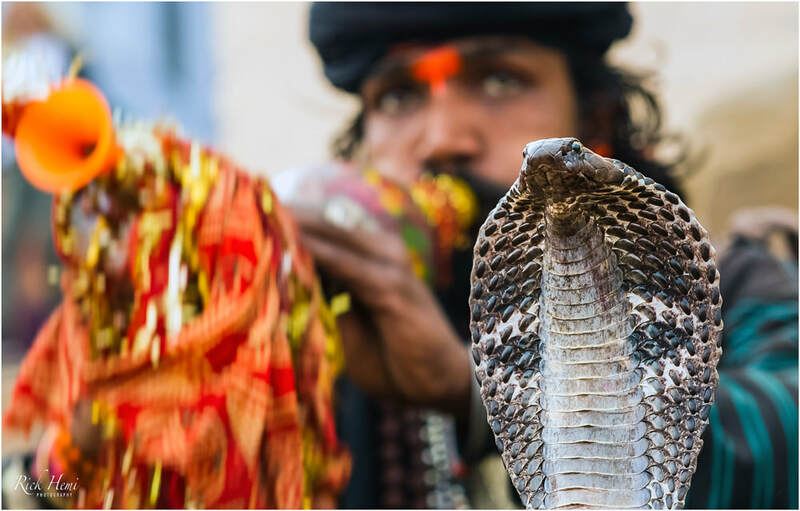 Indian snake charmers on the other hand originate from the Sapera or Sapuakela castes. Their tradition goes back centuries, but the banning of owning reptiles was passed into law in 1972. Snake charmers being nomadic can still be seen in rural villages, and ghats. Most of India's major cities are entwined with an array of new and historical structures with some seen spread across the skyline. 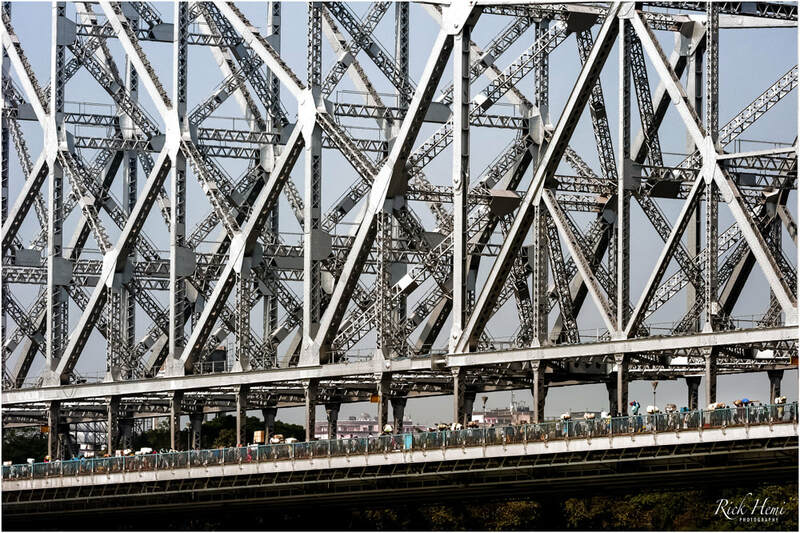 Kolkata's classic Howrah bridge, which received a name change to Rabindra Setu bridge is one of many famous icons of the city. Over one hundred thousand vehicles cross over the bridge daily, including an estimated two hundred thousand pedestrians. It's probably the most used cantilever bridge in the world. A little downstream is the newer Hooghly bridge which has considerably helped the traffic flow congestion across the Hooghly river. 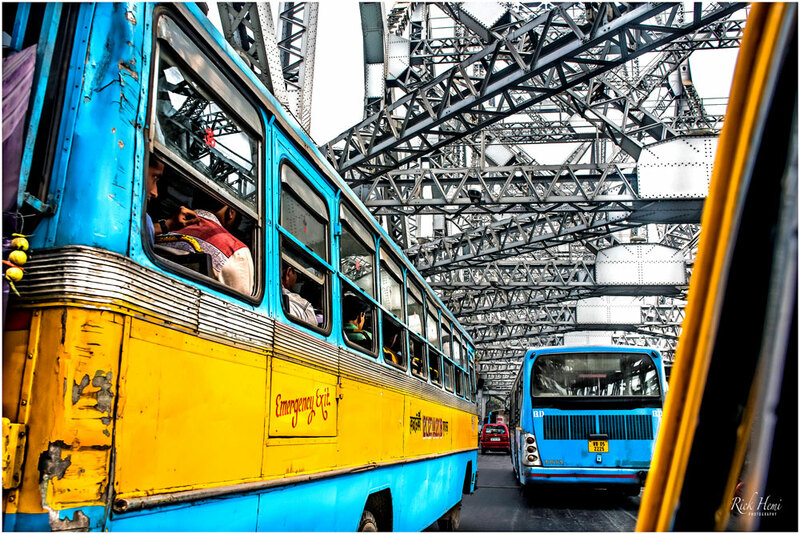 The image above taken mid-morning shows a constant flow of people in transit carrying possessions, luggage and baggage across Howrah bridge. The steady flow rate of people continues non-stop throughout the course of the day till the sun sets. Below, traffic is also at constant pace all day - everyday. Photography is actually not permitted on the bridge, but some foreigners (and locals) do grab quick-snaps at their own risk. 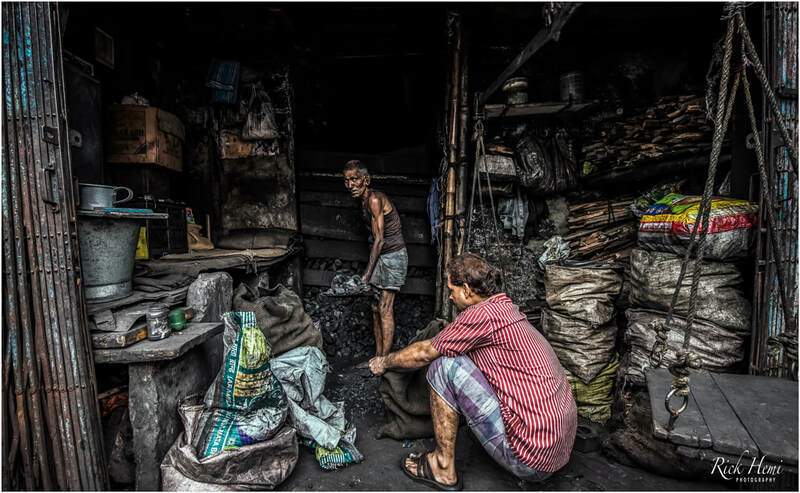 Coal is still a natural commodity in demand throughout India that's used for cooking, and heating purposes. It's cheap and plentiful, which still makes this mineral a favourite for heating purposes amongst many locals. 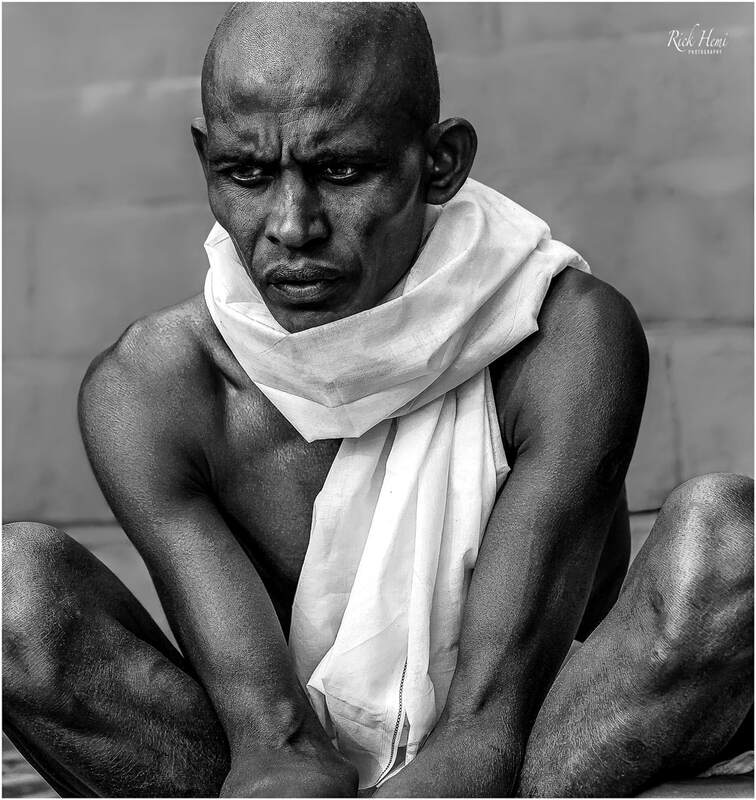 A capture of a local pilgrim in trance state - Tamil Nadu. A quick definition of trance state is when one loses one's body consciousness, and enters into the world of deep absorbtion into one's subconscious mind. 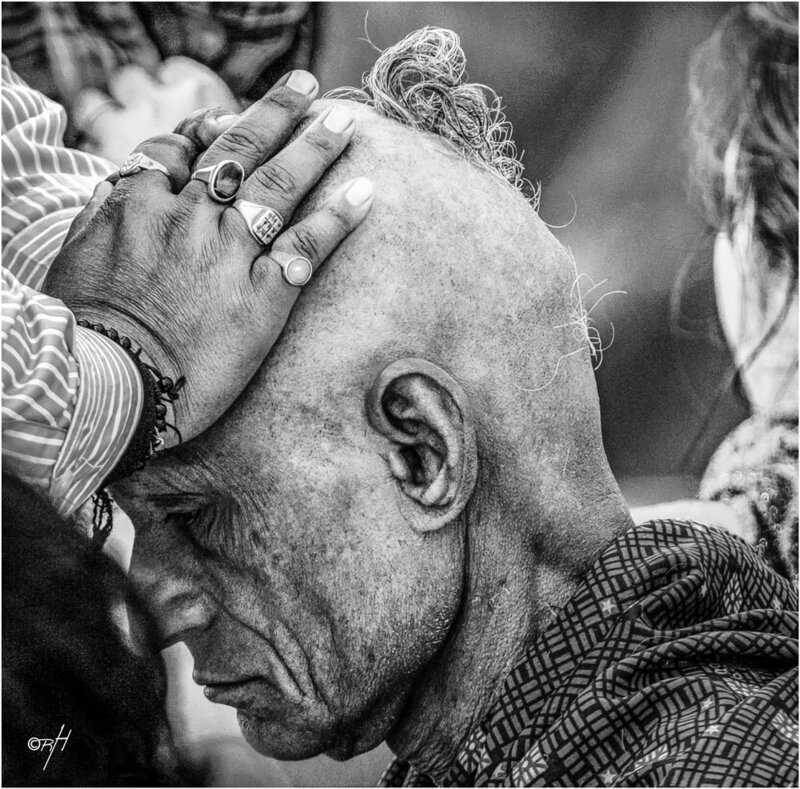 Nothing beats a good head massage from one of the many thousands of street masseurs throughout India that's guaranteed to full satisfaction. 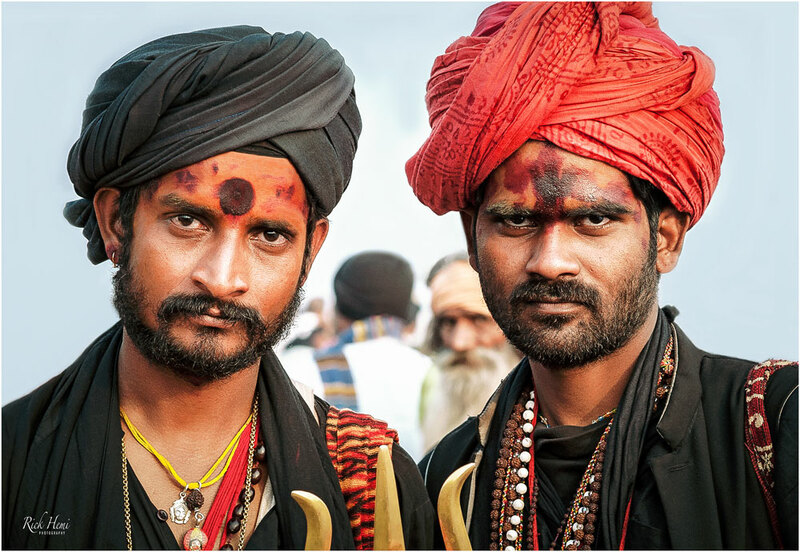 Charas (hashish) has been used by the Naga Sadhus, Aghoris, and Tantric Bhairava sects for centuries in connection with religious purposes in India. Although Hash was made illegal under Indian law in the 1980's, it has now become a grey area that's more relaxed for individual use, but trafficking the drug still holds up to a 10 year jail term. Charas is normally smoked in clay pipes called chillums. High grade quality hashish comes from cannabis plants grown and cultivated in the mountainous regions in Himachal Pradesh state. 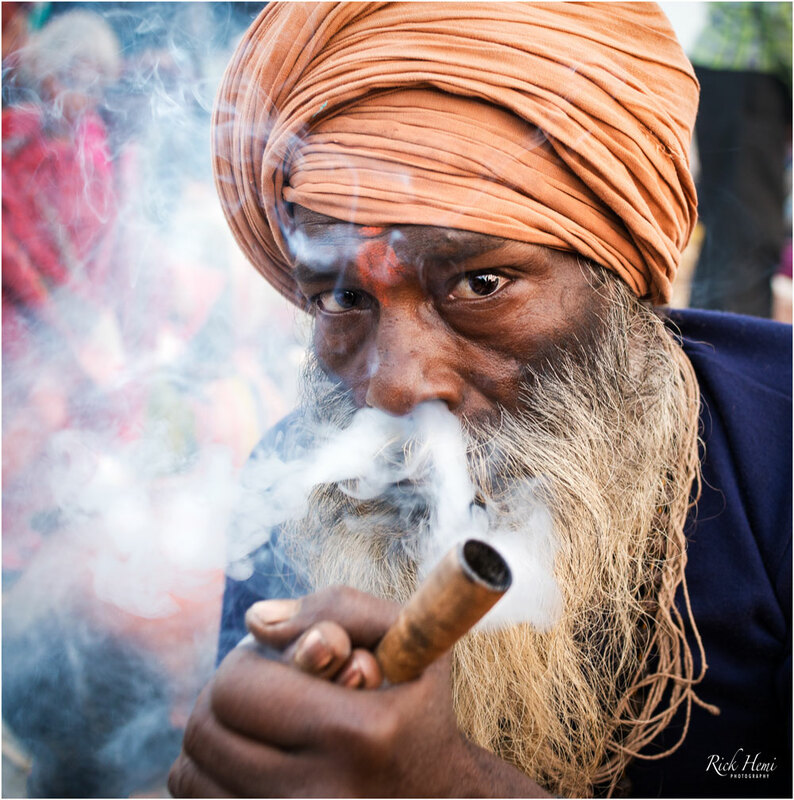 Sadhus from all different sects of Hinduism in India can be seen lighting up loaded chillums of charas during most religious festivals and washing ghats. Travelling through India, one quickly realises how vast the multitude of people there are across the country who work their bones off seven days a week around the clock non-stop. This is witnessed through rural regions coast to coast where fishing villages and paddy fields are located that have all types of different agriculture. The image above shows a local from a fishing village carving up a part of the day's catch. The below image are women in fast motion carrying bundles of fodder to their village - Odisha and Andhra Pradesh states. An image of a Dalit (untouchable) loading cremated ash into a sifting pan at the main burning ghat in Varanasi. A daily rotating shift of Dalits share a portion of the Gold and silver from each 24 hour cycle of cremated ash. The ash is panned on the edge of the Ganges beside the cremation area. The image also shows a family with their deceased which was transported by boat, and about to prepare for the last rites (immersion and cremation). Note: Prior permission is normally required by foreigners to photograph within the vicinity of the main burning ghat - unless by invitation. If antique gateways, manual street water pumps, or colonial styled buildings are of interest, then India has more than enough antique street nostalgia to keep anyone busy through the country. 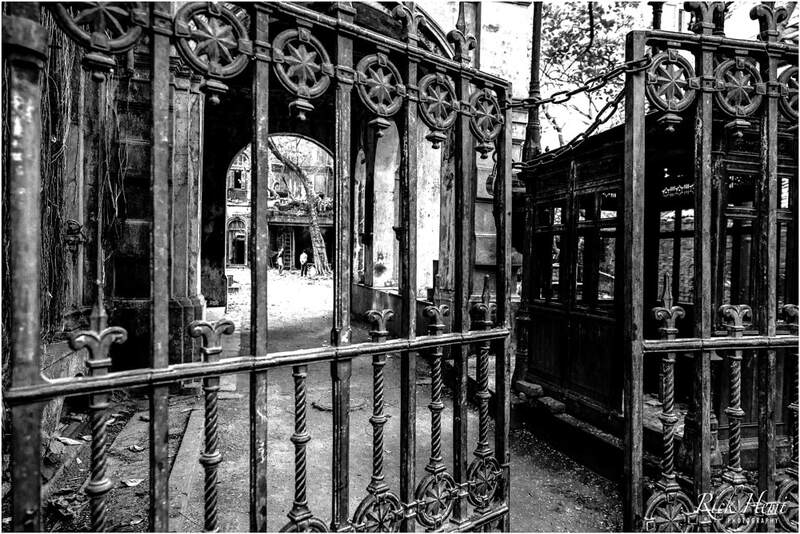 Many classic styled gateways like the one above are usually located within the old quarters of large cities. Roaming around inside colonial areas, especially down quiet side streets or lane ways will usually have some remains of colonial heritage. 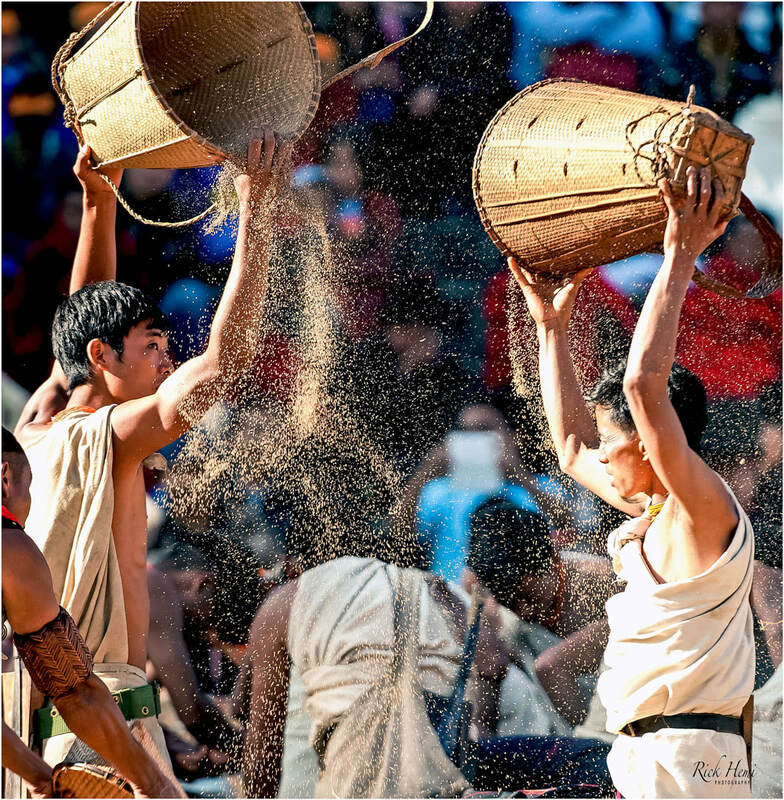 The Hornbill festival has been a great success since its creation. The event congregates seventeen different tribes throughout Nagaland for a full on ten day gathering of ethnic dance and song. 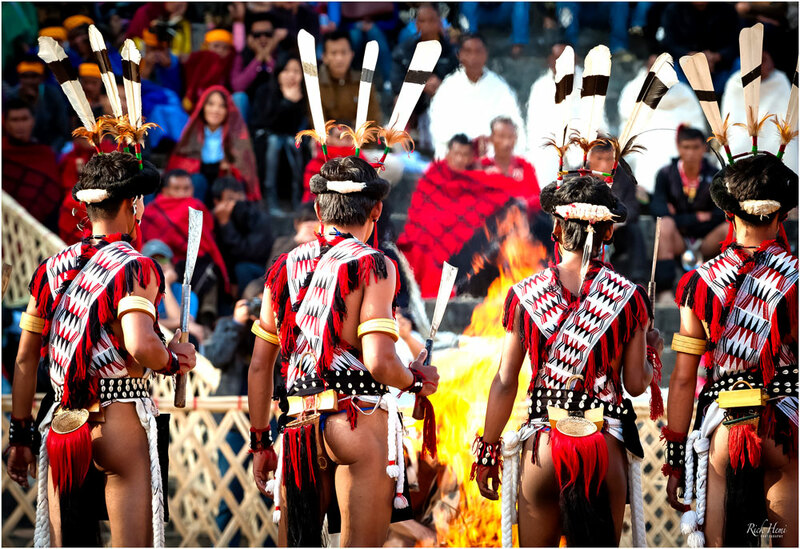 The festival is usually held in early December situated south of Kohima. Nagaland is a dry state (no alcohol), but during the Hornbill festival rice wine is plentiful. Warm clothing is necessary due to the altitude and winter temperatures which can drop below zero. Many foreign street photographers end up finding out quickly that a 3 month visit to India is far too short to cover the entire country. Even a 6 month trip through India will depend what time of the year one arrives. Since the mid 80's, I've had over 12 visits with more to come through the next few years. Being a freelance street photographer, and having spent plenty of time through Africa, South America, the Mid East, and other regions in Asia, I have to admit that India is probably the most favourable country in the world to capture all types of street images beyond imagination. The abundance of wildlife, landscape, astro, street scenes, and the endless mix of cultures, including borders to Nepal, Bhutan, Myanmar, Bangladesh, and Pakistan makes it even harder not to return. 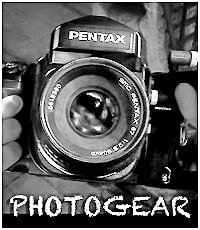 Got a Camera or Lens Problem while in India? - Latif Precision Works can be trusted! Photo-gear can be repaired in India if necessary, which I personally have had done recently with an optic that needed a service. This includes sensor cleaning, and fungus removal inside optics. Latif Precision Works in Kolkata have been servicing photo-gear for decades, and are known for their quality workmanship which I can personally recommend. 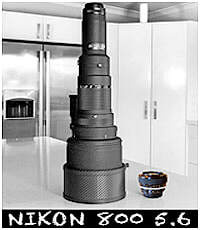 Image: an AF Nikon 85mm f/1.4D lens receiving a full service.